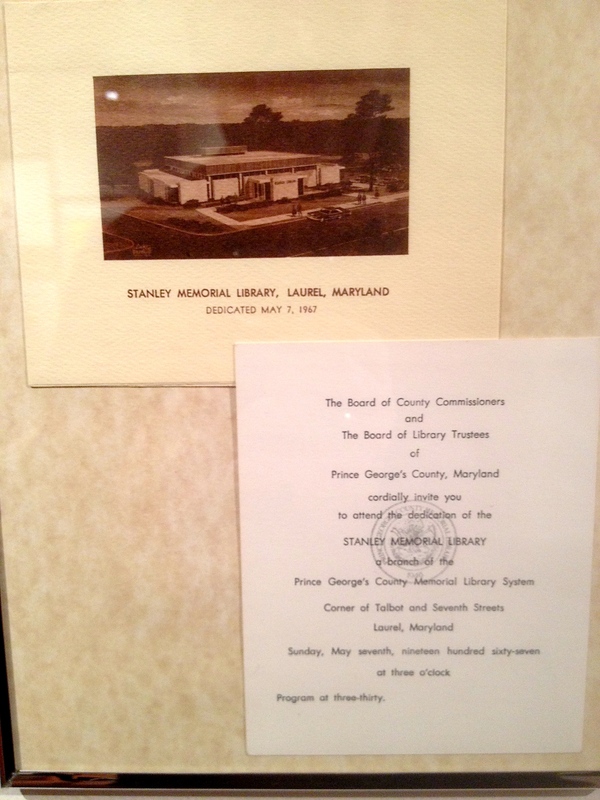 By now, many of you already know that the Stanley Memorial Library has always been a very special place for me. It was the first library I can remember ever going into as a child, and I still vividly recall my amazement at learning that there was no limit to how many books I could check out at any given time—and that it was all completely free. What madness! “How do they stay in business? !” I asked my mom. 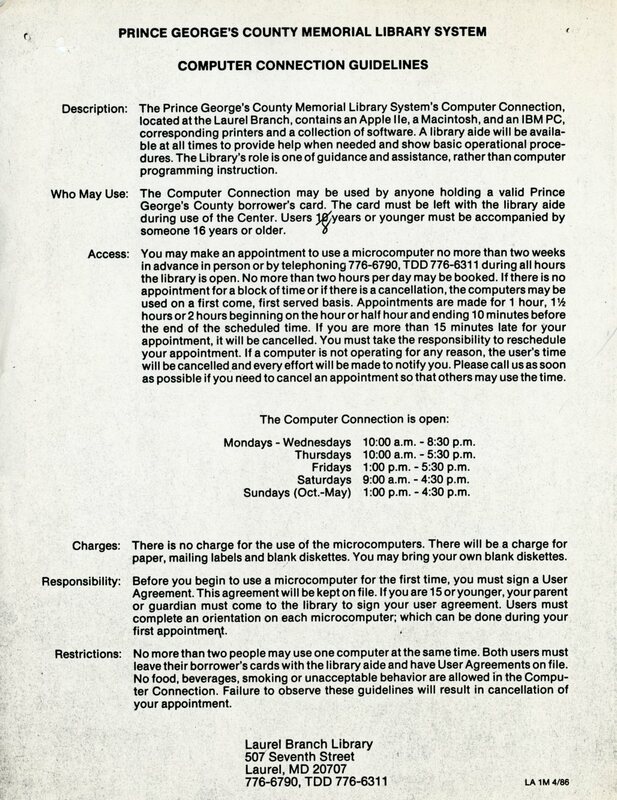 Fast-forward a few years; and as a not-quite-fifteen-year-old kid in 1987, I got my work permit and was given my very first part-time job: manning the desk at the “Computer Connection“—the library’s small public computer lab. 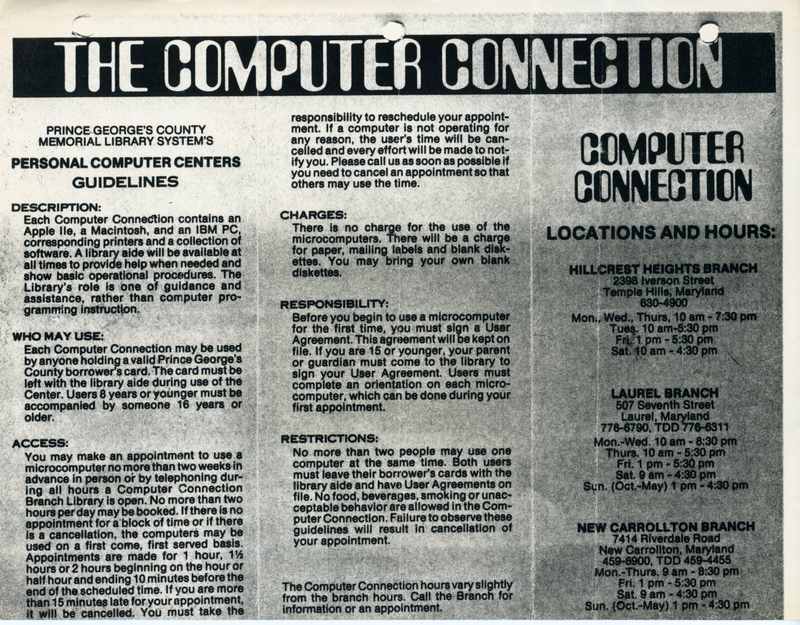 I scheduled reservations for people I can still picture to this day, including Mr. Anderson, the budding fiction writer who plugged away at the Apple IIe at least twice a month. Other, more utilitarian types booked time on the IBM PC; and surprisingly, hardly anyone ever used the Macintosh. Librarian Carl Keehn, who’d hired me, was the first to encourage me to take advantage of any downtime by learning all I could—particularly on that Macintosh. (As a graphic designer today, that’s my primary tool). As I recently learned from Carl, I almost didn’t get that job. Not because I wasn’t qualified, but because I was still underage. The law didn’t allow me to work past 8:30, and the job required me to stay until 8:45. The library actually ended up applying for a waiver, and the rest was history. The Computer Connection gig only lasted a couple of years, though, as the first of many county cutbacks began to loom. Nonetheless, while the computers were going bye-bye for the 1990s, I was glad to learn that my job wasn’t. In fact, it was really just beginning. 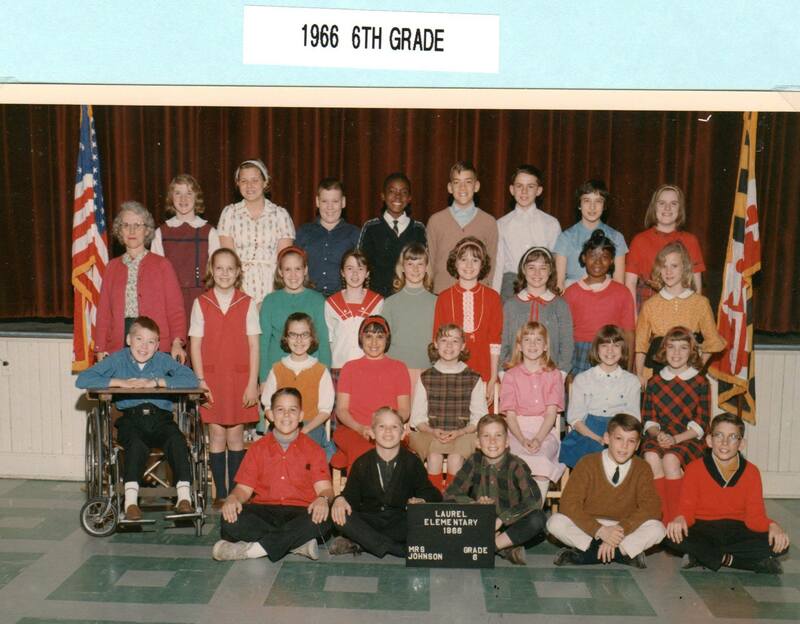 I was reassigned as a clerical aide, or page—where I got to re-shelve books and locate back issue periodicals for patrons. Well, I’m not going to bore you with my whole employment story again. 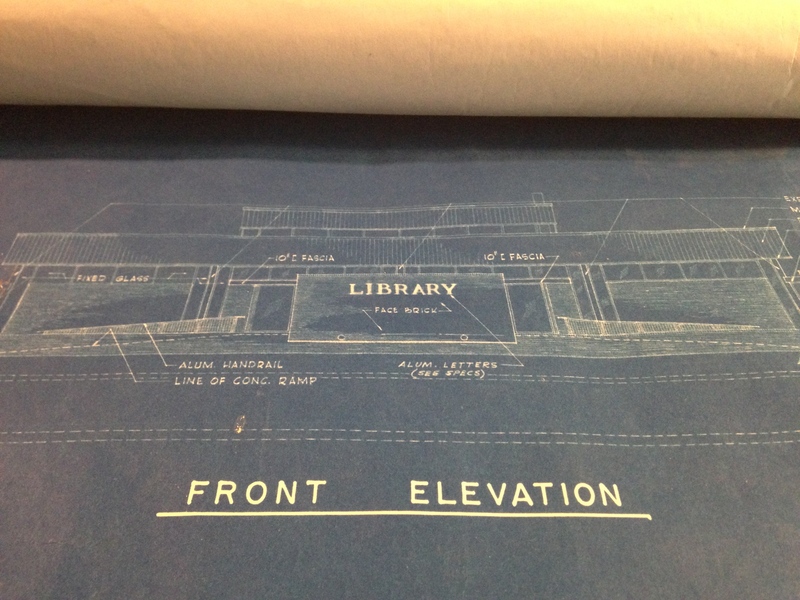 Suffice it to say that I grew up in that library. Not only was it my first job, I ended up working there all throughout high school and college. I can’t begin to count how many good memories that place holds for me. Even the very first date I ever went on—the library is where I met and nervously asked out that first girl I really liked, right there in the parking lot. Even after starting my first full-time graphic design job in 1997, I clung to the library; I continued to work part-time on the weekends, not because I needed to, but because I guess I really just didn’t want to let it go. 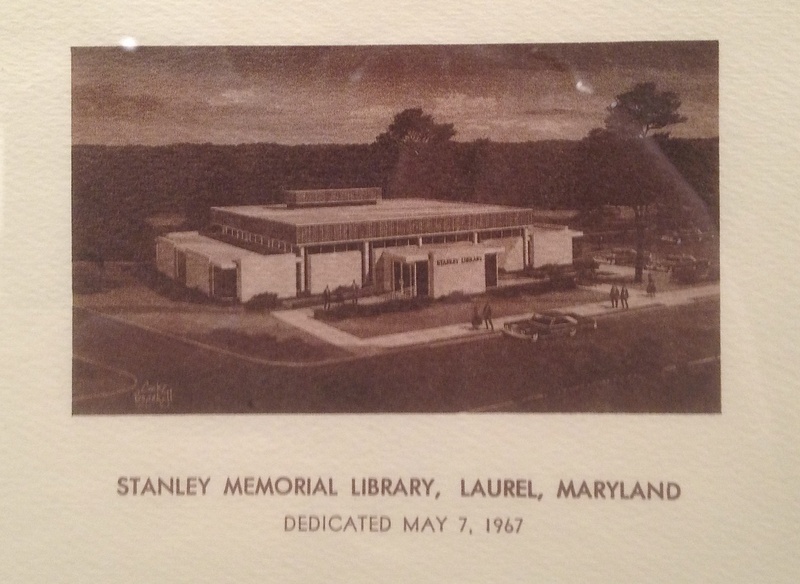 And that feeling that crept back again, nearly 20 years later—with the announcement of a new Laurel Library branch now due to be built on the site by 2017. 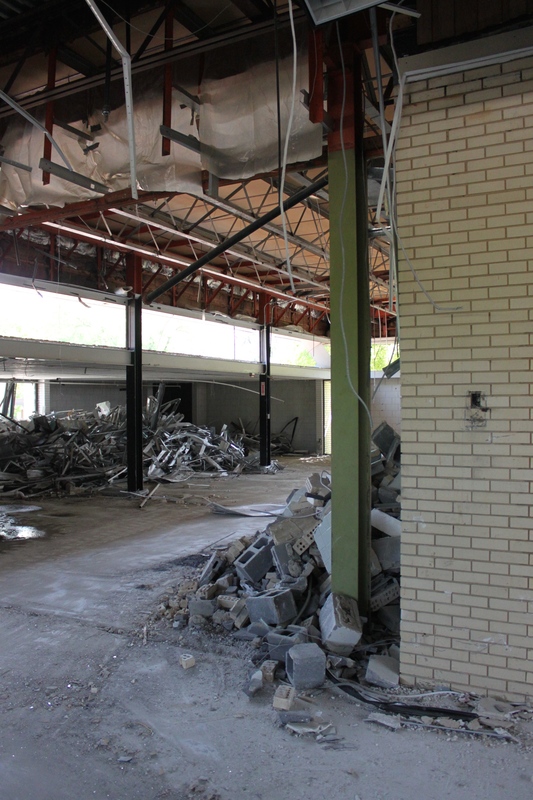 Yes, even in spite of the 1993 expansion which nearly tripled the size of the original building, the old library had far outgrown the space. 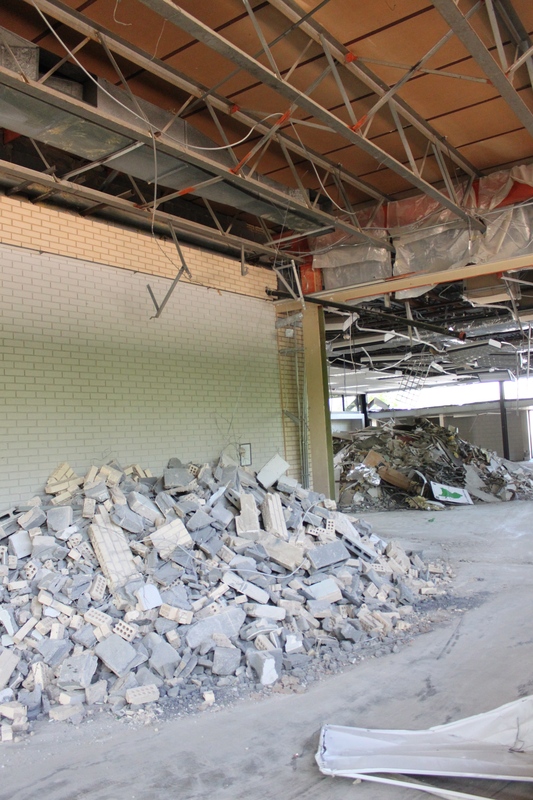 But to imagine those old walls, the sight of which conjure so many fond memories, being torn down—it was a tough pill to swallow. 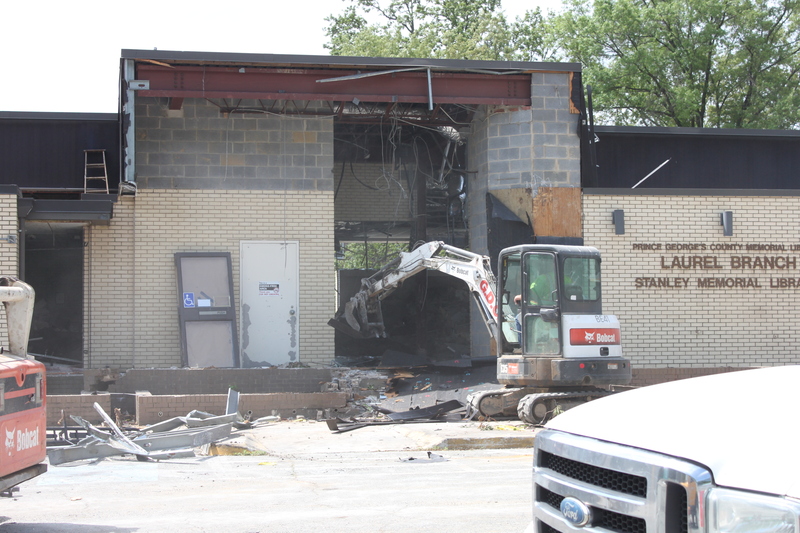 The demolition was originally scheduled for last fall, I believe; but for one reason or another, there were delays. 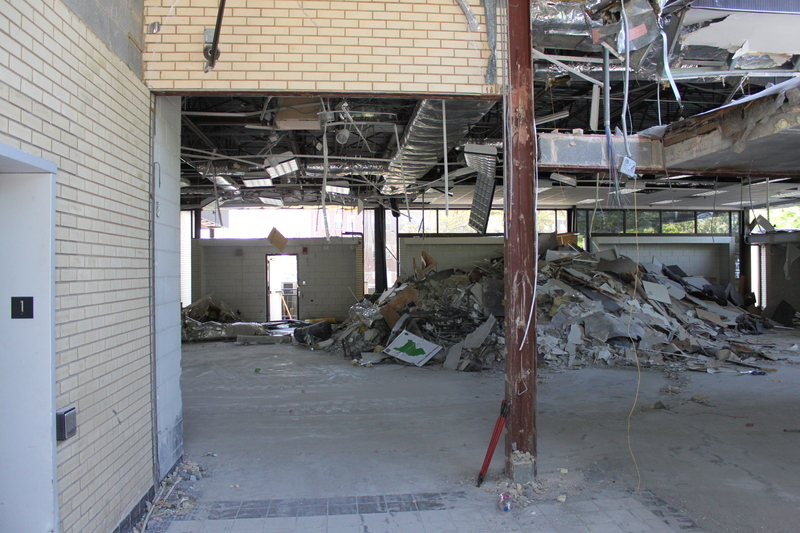 The library’s last day of operation in this building had been March 8, 2014. 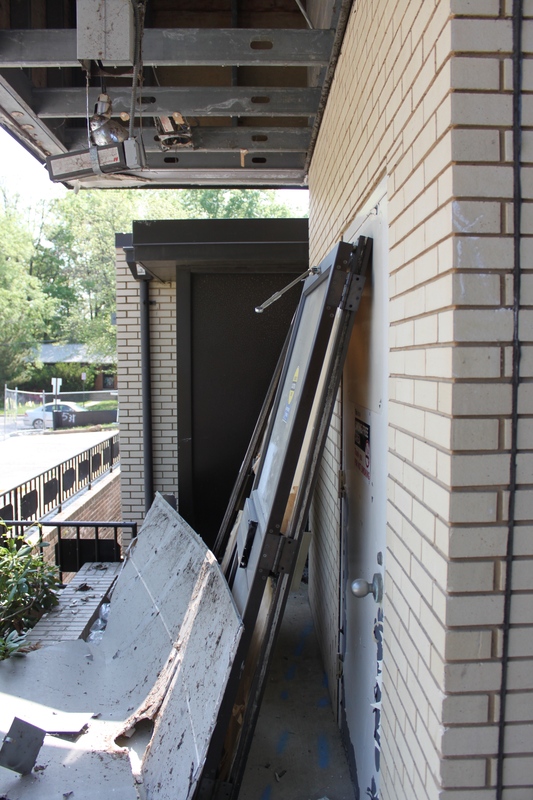 Shortly thereafter, a temporary (and much smaller) facility was established behind City Hall at 8101 Sandy Spring Road. 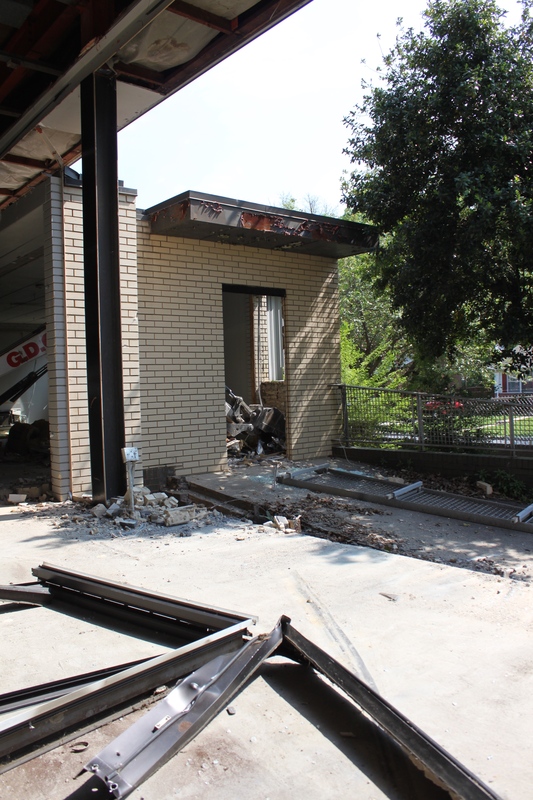 But the old building sat empty and untouched for over a year, until finally, the familiar signs of pending destruction began to emerge: construction crew trailers were installed in the parking lot, and a chain link fence went up around the perimeter. Each weekend, I’d make the drive from Centreville, VA to Laurel, hoping to catch the first moments of it on film, but dreading it at the same time. 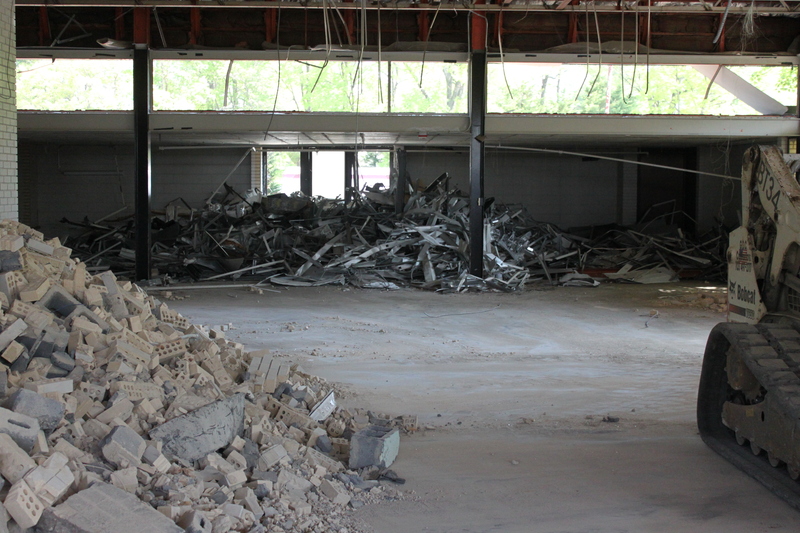 Worse, I feared that one day soon, I’d approach that familiar corner of Seventh Street and Talbott Avenue, and the old library would be nothing more than a pile of rubble. 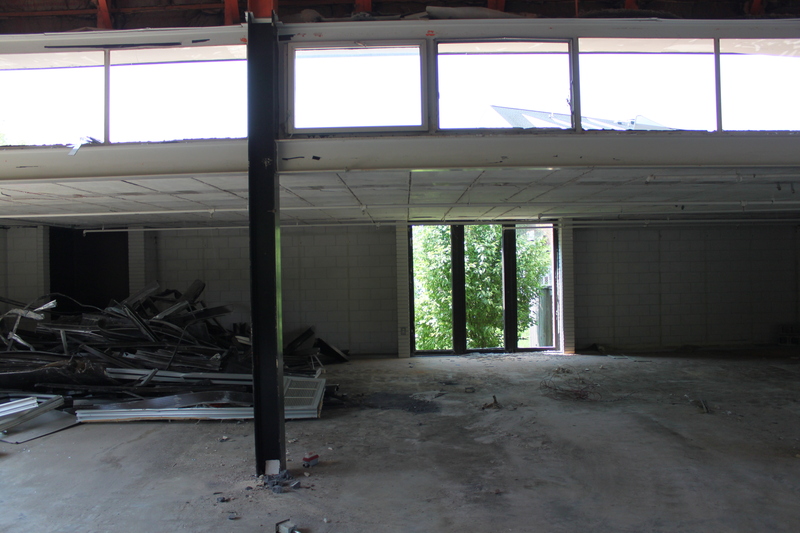 Finally, I got word that NARDI Construction, Inc. was ready to start. 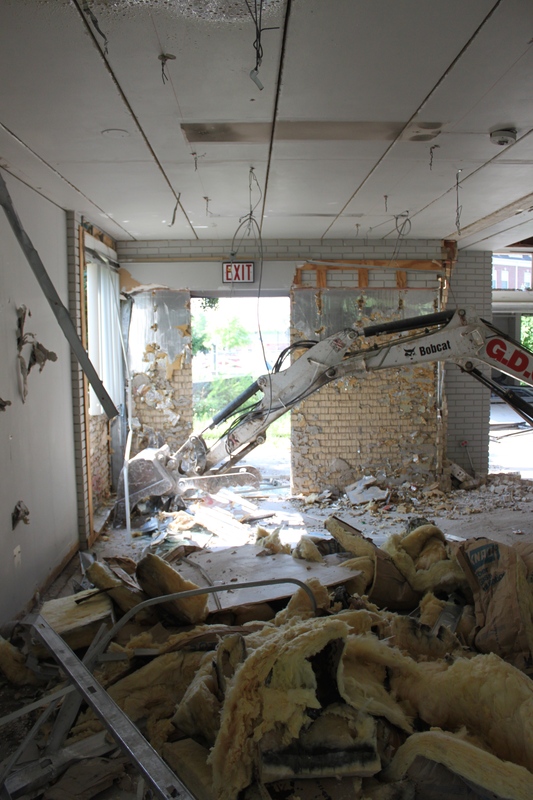 On May 6th, 2015, I drove to the site and met foreman Chuck McNulty, who regrettably told me that the excavators they were expecting that morning hadn’t showed up after all—it looked like they wouldn’t start tearing the building down in earnest until the next day. But it was hardly a wasted trip, as Chuck asked if I’d be interested in taking a few mementos his team had salvaged. 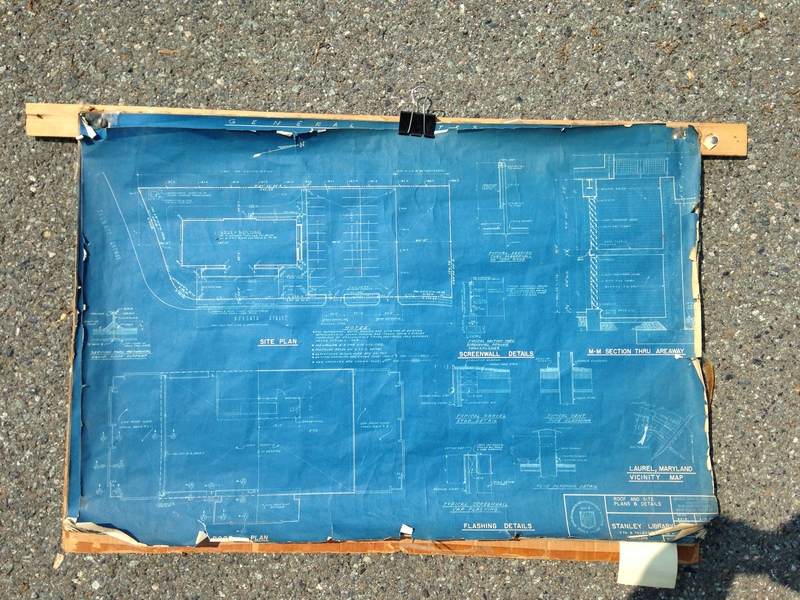 Little did I imagine these would include the original, complete set of blueprints from 1965—blueprints I remember hanging in the basement office of the late Tom Acra, the library’s beloved maintenance man. He told me it was okay to film and photograph anything I wanted (with the exception of the workers themselves, some of whom may not want their pictures taken). 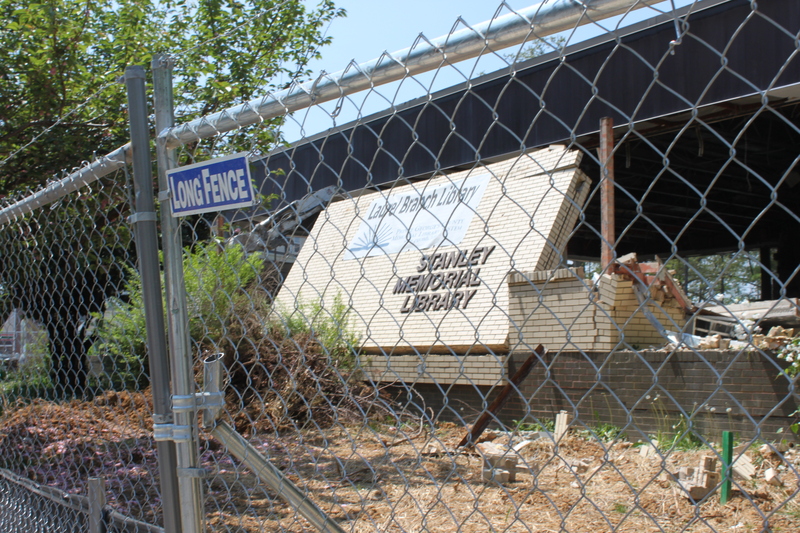 I grabbed both my video camera and the still camera, stepped over the caution-taped hard hat area, and into the vacant shell of the Stanley Memorial Library one last time. 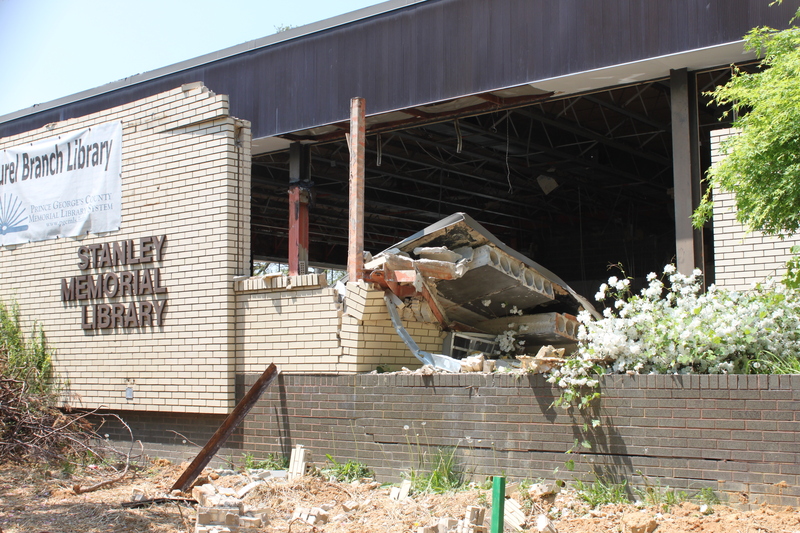 It didn’t occur to me until I’d gone home and started sorting through my photos that the demolition came on the anniversary of the library’s official dedication. 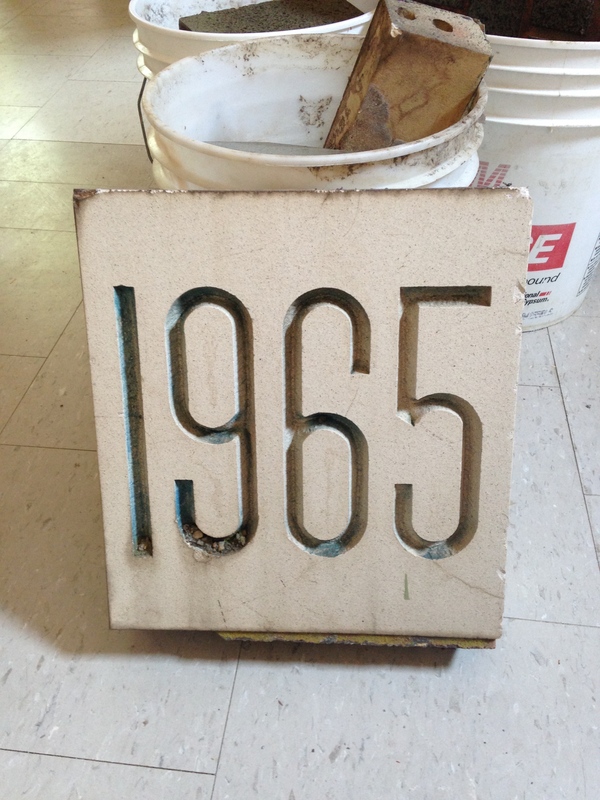 While the building had opened in 1965, the dedication didn’t actually happen until May 7, 1967. 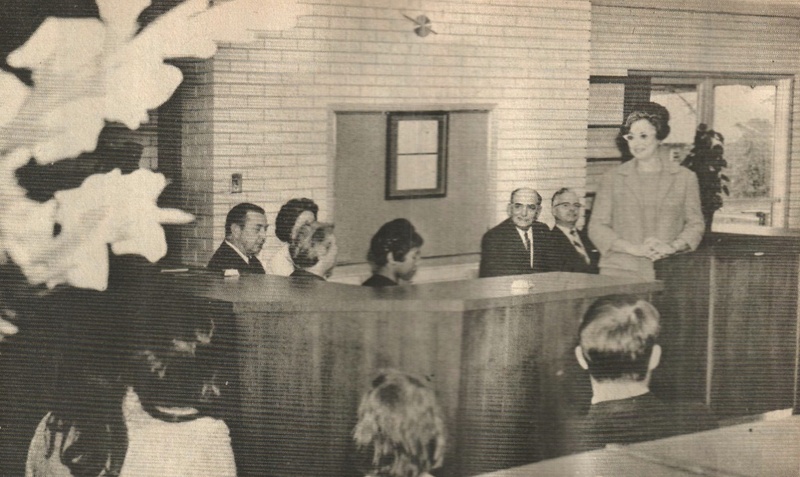 Forty-eight years ago to the day, future U.S. Congresswoman Gladys Noon Spellman, Laurel Mayor Merrill Harrison, and other local officials had assembled behind the original circulation desk and delivered the dedication. 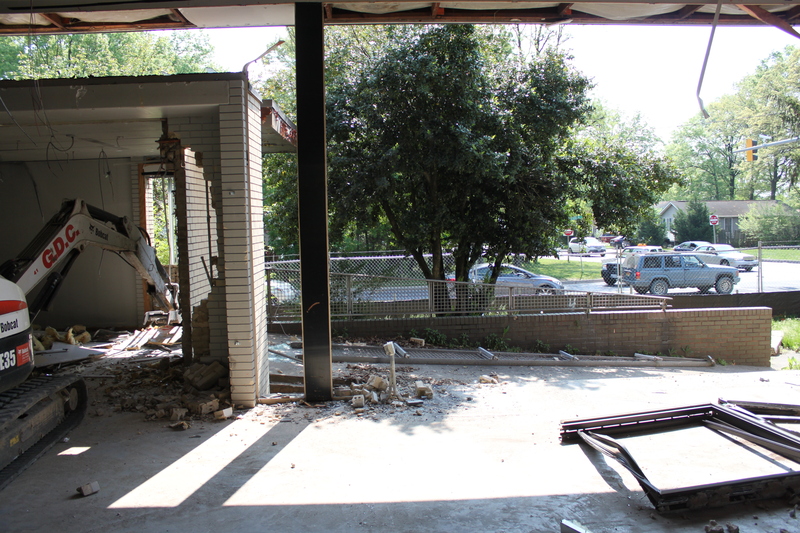 And now, there I was at the same spot, moments before the building would finally meet its end. 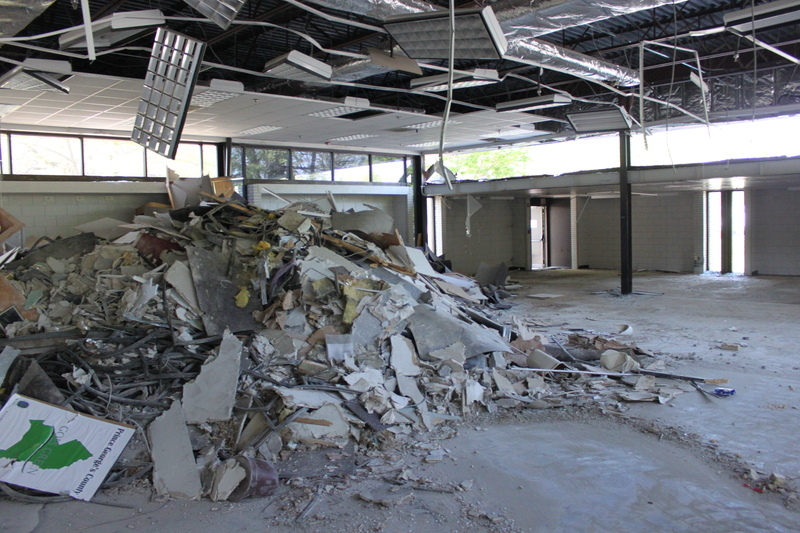 For 50 years, this library had stood here; countless patrons milling about its shelves for bestsellers and all sorts of media… (I’ve even heard stories of an actual art collection being loaned out in the ’70s—you could borrow a new painting for your living room wall every couple of weeks!) 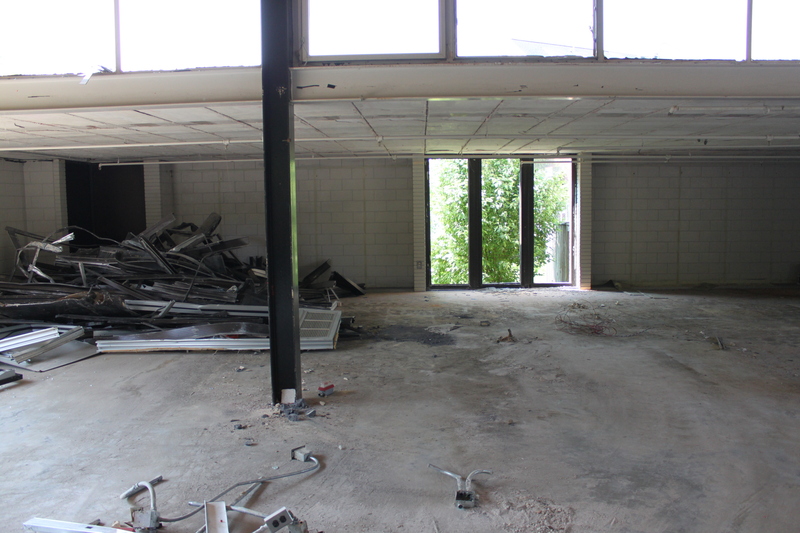 And of course, my thoughts went to the many people who worked here, both before and after my time as a staff member. That’s when it dawned on me that of all those people, I suddenly found myself being the last one who’d ever walk through it again. 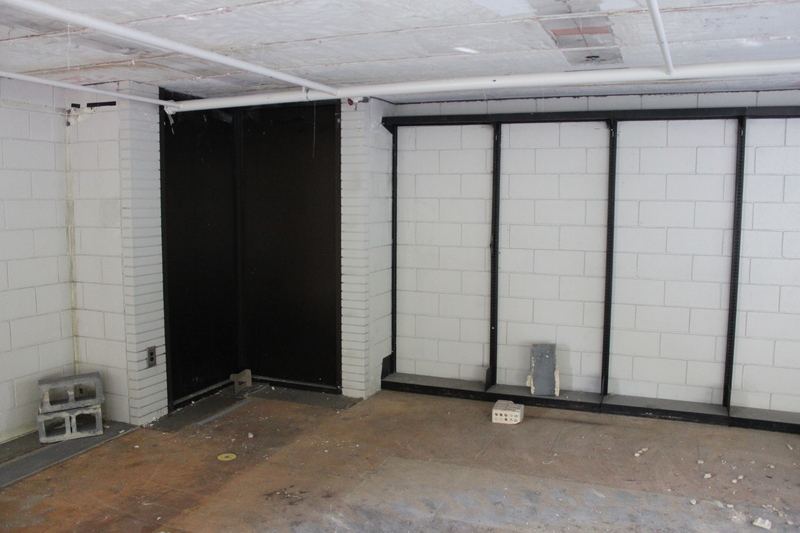 Chuck said that they wouldn’t likely get to the other major sections that day, but I’d seen enough. I’m not sure I wanted to see the expansion side come down—the section that was brand new in 1993, which seems like just the blink of an eye ago. The construction crew took a brief break over the weekend (the Main Street Festival proved a welcome distraction to any other nostalgic library types like me) and was back at it on Monday, May 11th. 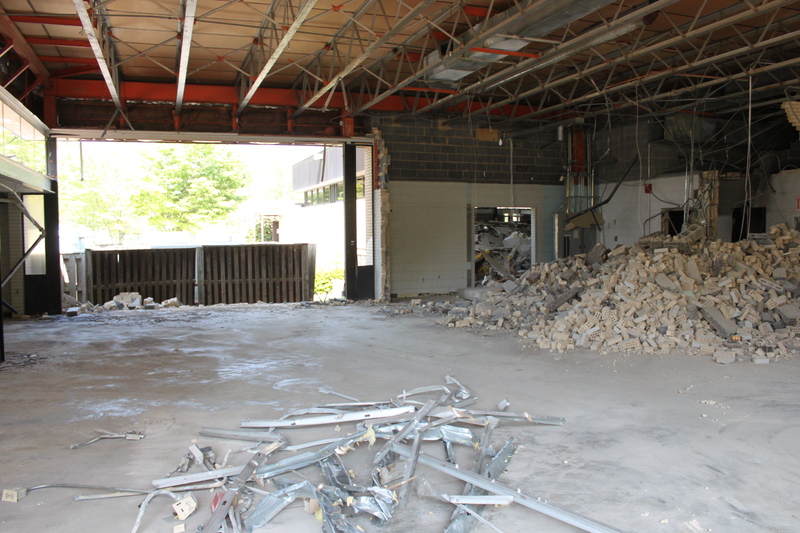 By the end of this week, if not sooner, the rest of the library will be leveled. 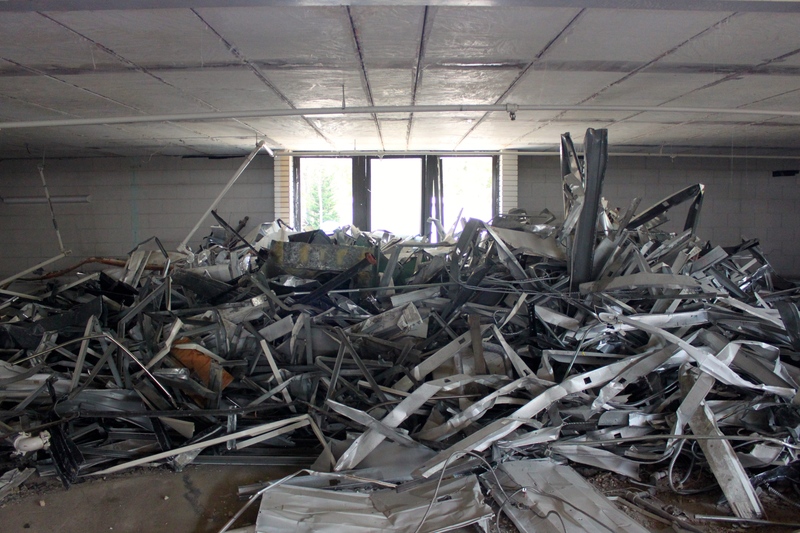 You can peruse my full set of photos on Flickr, which includes several days leading up to and during the demolition. I’ll be adding to it in the weeks to come. 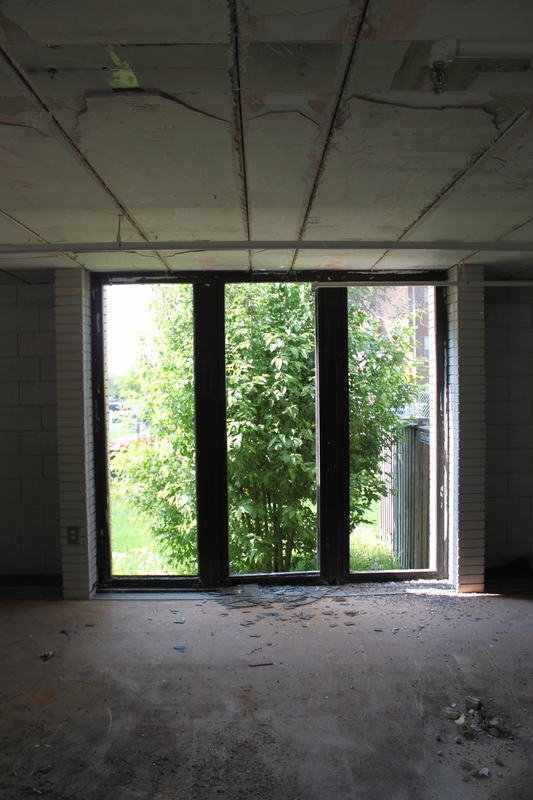 Many thanks again to Chuck McNulty and NARDI Construction for going above and beyond in providing me access to document the building’s demise, and for saving some one-of-a-kind historical mementos. 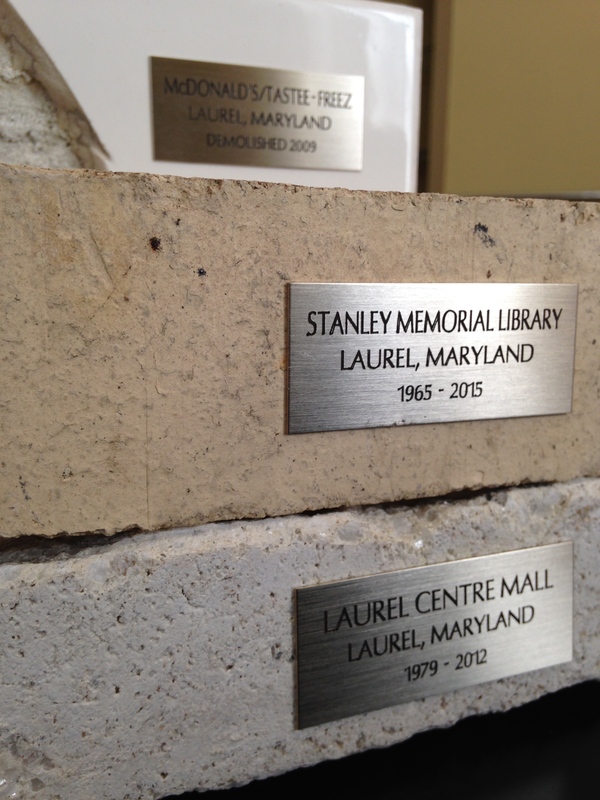 The cornerstone and dedication plate will be preserved in the Laurel Museum. 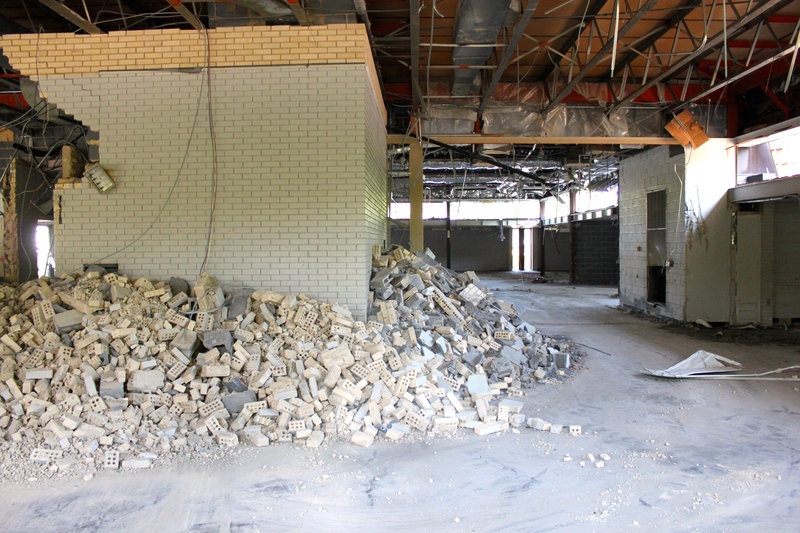 He also set aside several bricks for me, and even helped load them into my truck—bricks that I’ll be distributing to former library colleagues as one last little piece of this place we loved. I still occasionally get comments from new Lost Laurel Facebook readers, asking why certain businesses don’t seem to be featured. One that comes up quite often: “What about Dottie’s Trophies?” And I have to explain that A) the concept of Lost Laurel is that these are all places that are no longer in business. 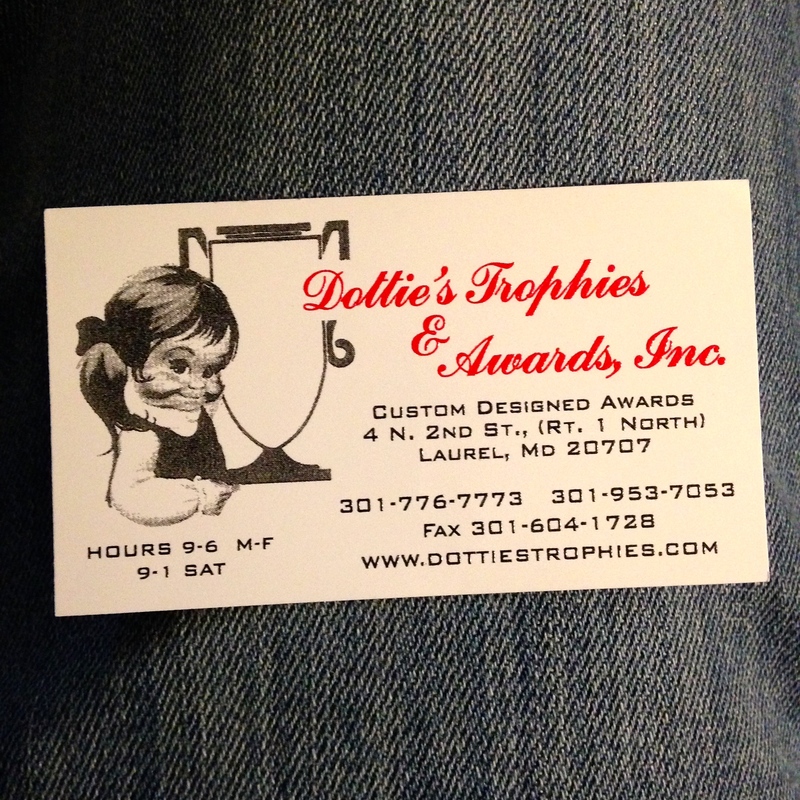 And B) Dottie’s Trophies—sometimes to the surprise of many—is indeed still open for business. Since 1968, in fact, they’ve been continuously producing countless trophies and awards for sports teams and corporations in the Laurel area and beyond. It also dawned on me recently that I’d never actually been to Dottie’s Trophies in all these years. I’ve driven by it at least 1,232,000 times; and I’ve had at least a couple bowling trophies as a kid with Dottie’s name on the bottom. I decided to remedy that, and came up with what I think was a unique way to utilize their craft. 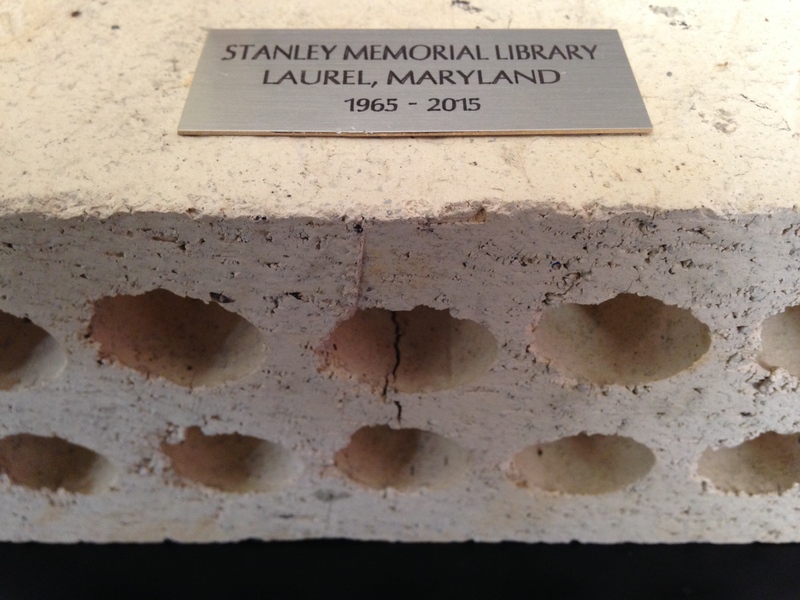 A little over a year ago, I was giving a presentation for the Laurel Historical Society when I met Mike McLaughlin—and he gave me a wonderful surprise gift. 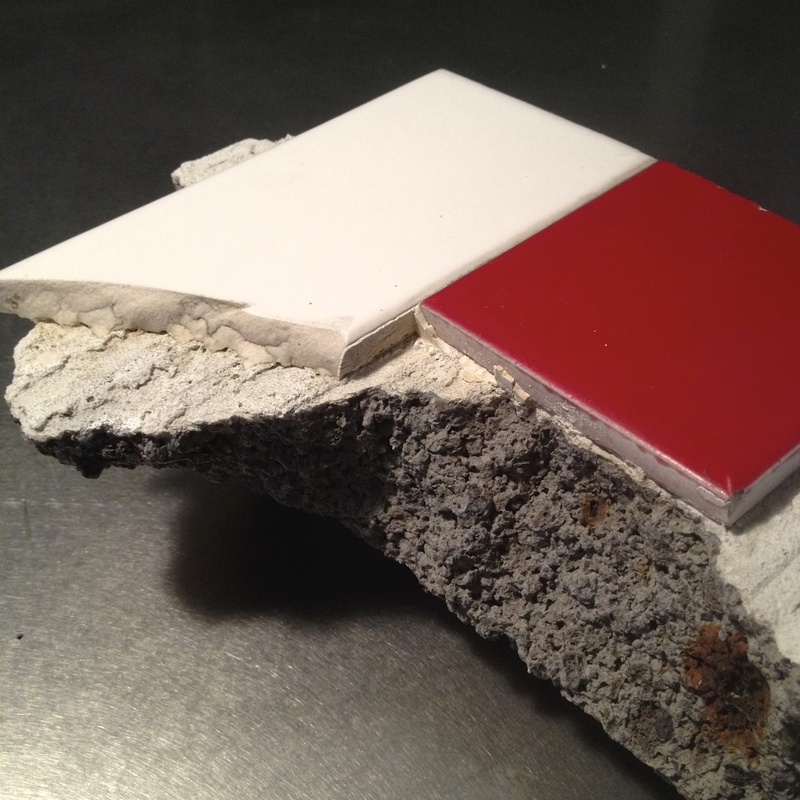 A pair of them, actually—pieces of concrete from the recently demolished ruins of two of my favorite Lost Laurel sites: the Tastee-Freez and the Laurel Centre Mall. 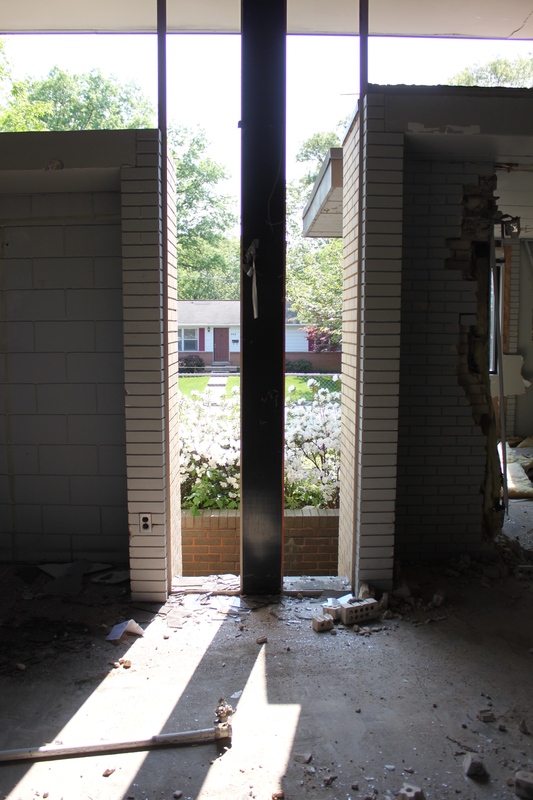 Mike had taken and shared some wonderful photos of the demolition process of both, and managed to salvage a few pieces of the buildings—literally—before they were gone for good. 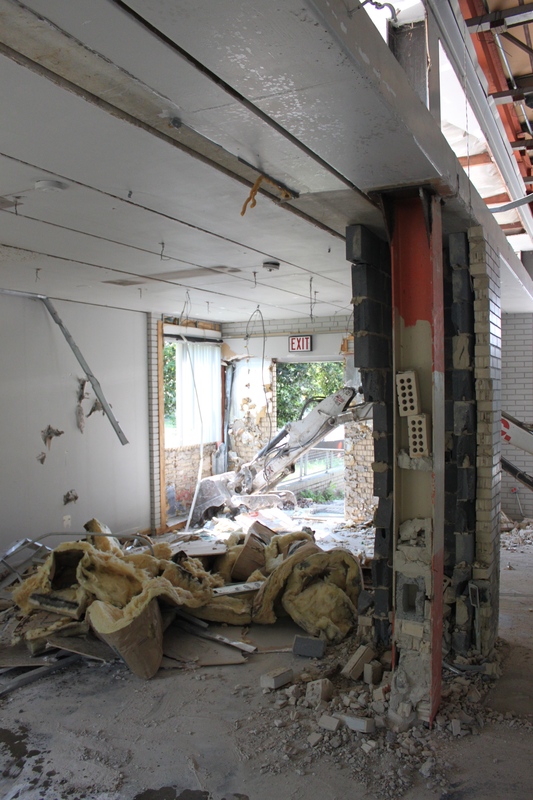 The amazing thing about the Tastee-Freez coming down was the reemergence of the red and white tiles underneath the exterior facade. 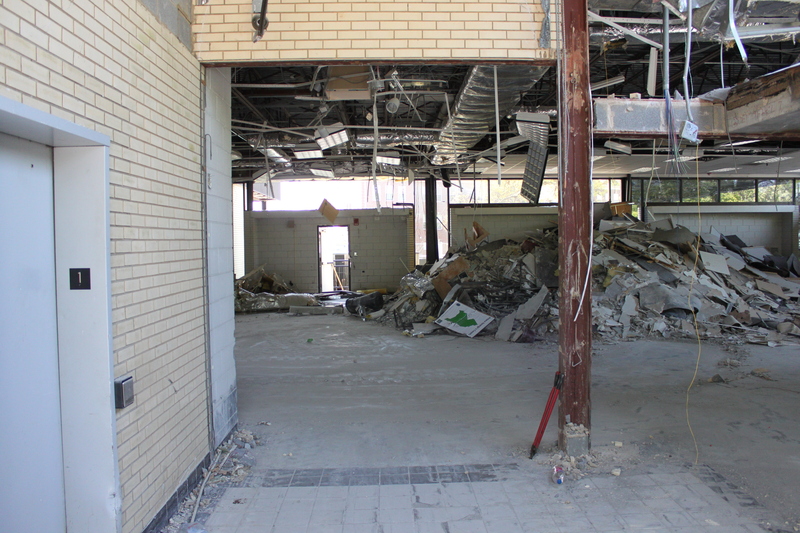 The tiles were from the 1960s, when the building was originally Laurel’s first McDonald’s. 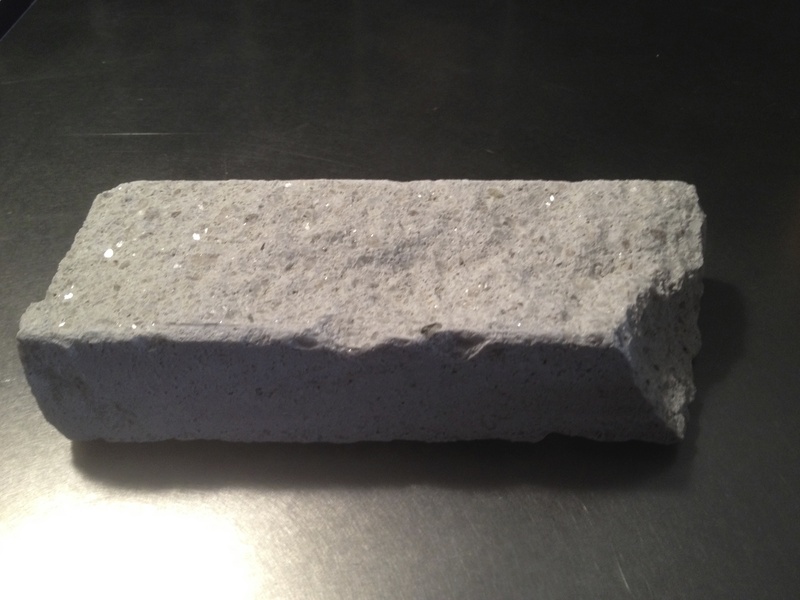 The white brick from the Mall still had those tiny flecks of crystal that would catch the sunlight on the Hecht’s/Macy’s side. 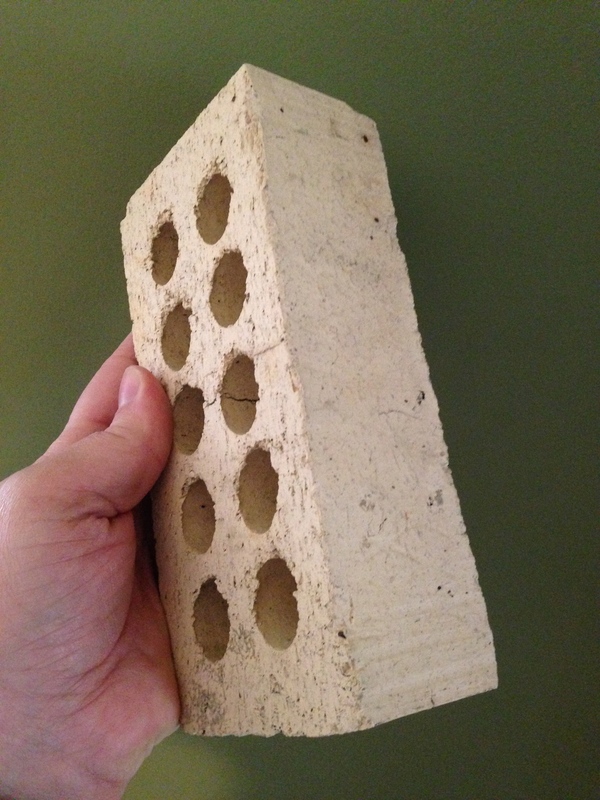 It’s funny how even a single brick can still trigger an image of the Mall as a whole. 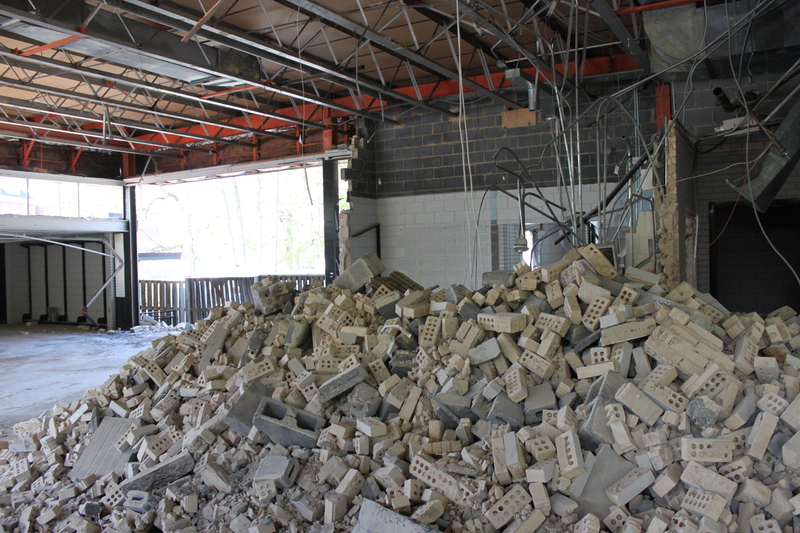 I thought of these bricks recently when it became apparent that demolition work on the Stanley Memorial Library is finally imminent. 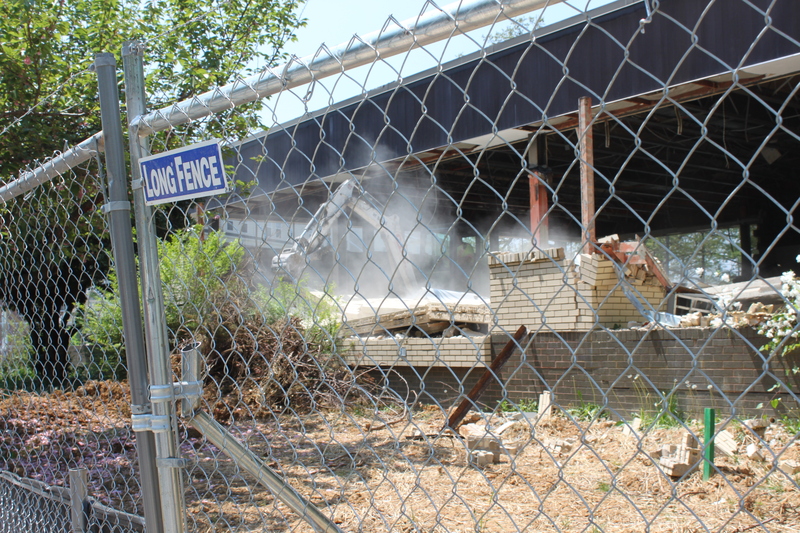 (As of this post, the building is still standing; but it’s surrounded by chain link fencing and work is likely to begin any day now.) My very first job was as a clerical aide at that library, and I ended up working there all throughout high school and college. It was and will always be a special place for me. 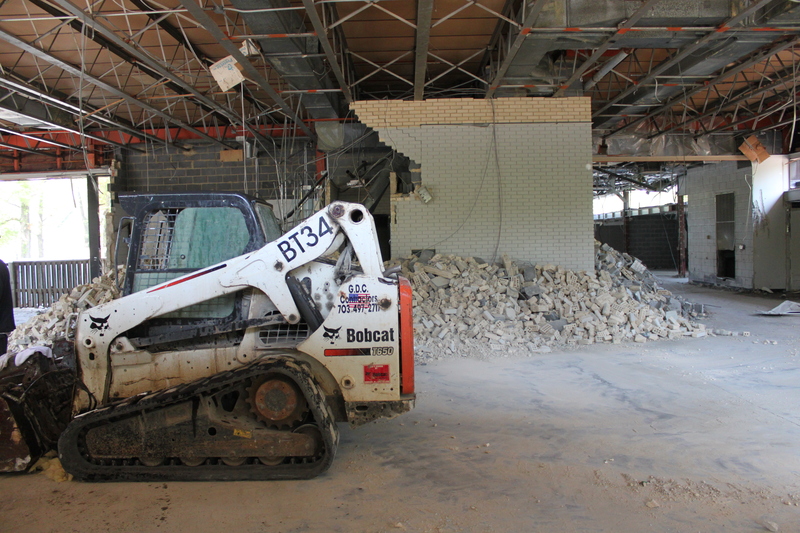 When the building comes down, I’d like to get a few bricks for myself and some former colleagues. 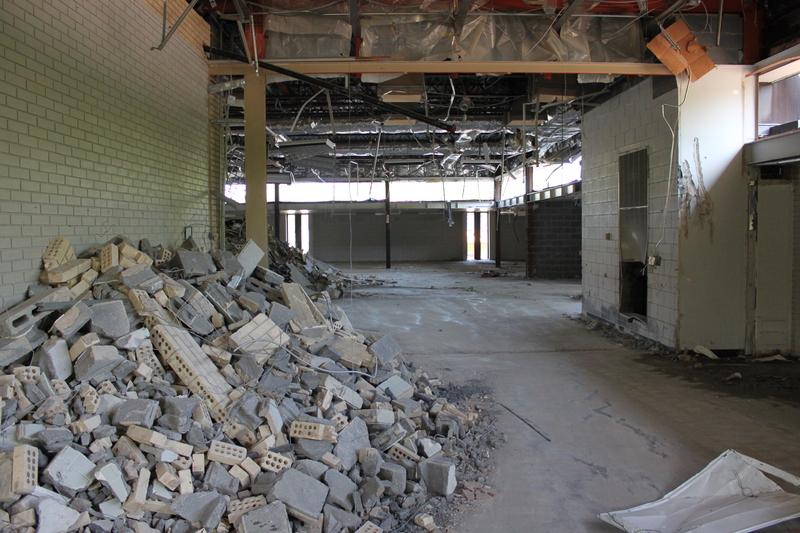 It turns out I didn’t have to wait for the library to fall down to get my brick, at least. 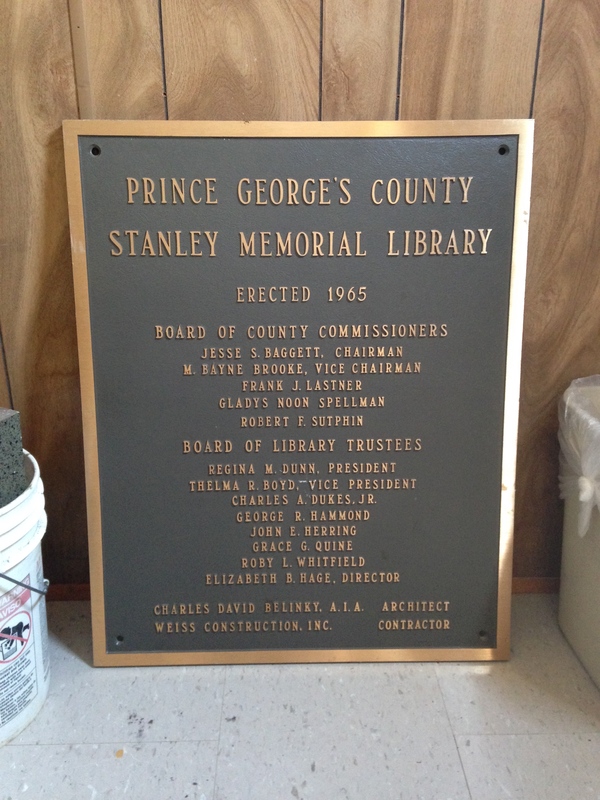 On a recent stop to photograph it, Pete Lewnes noticed one just sitting there loose near the missing cornerstone, (which I’m guessing either Prince George’s County Memorial Library System or the Laurel Museum had removed for posterity) and grabbed it for me. 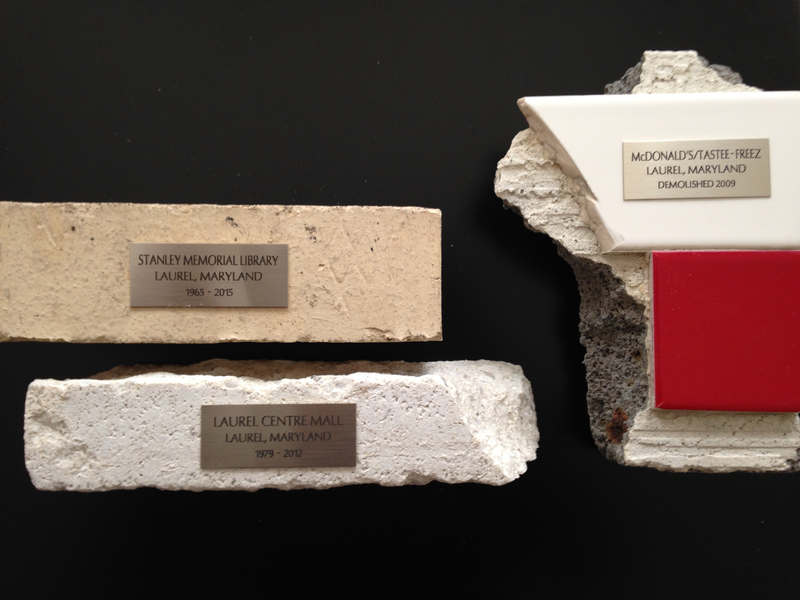 Because these old bricks and shards of masonry mean something to me—and hopefully to anyone with fond memories of the buildings they once comprised—I decided to have small, engraved name plates attached to them. And who better to do that than Dottie’s Trophies? It adds a sort of reverence even I wasn’t quite expecting. 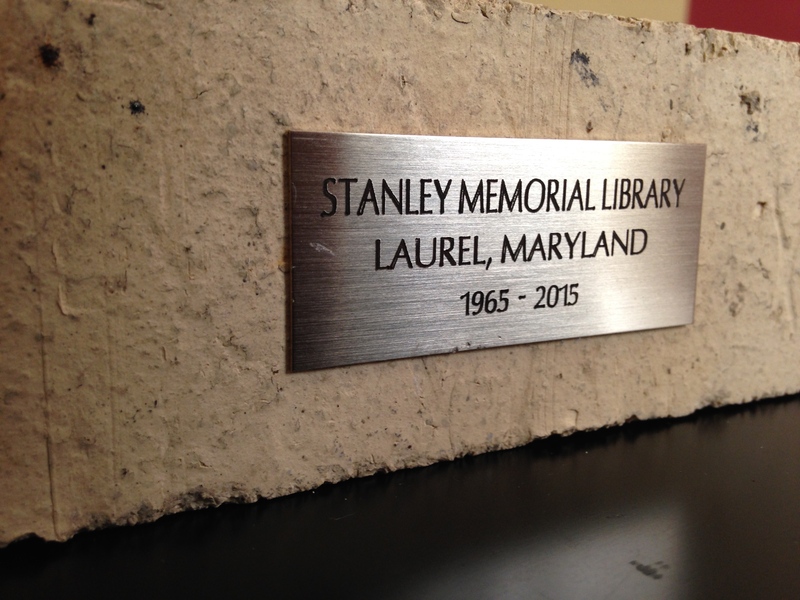 It also makes me wish I had a brick from all of the legendary places that have vanished from the Laurel landscape over the years. 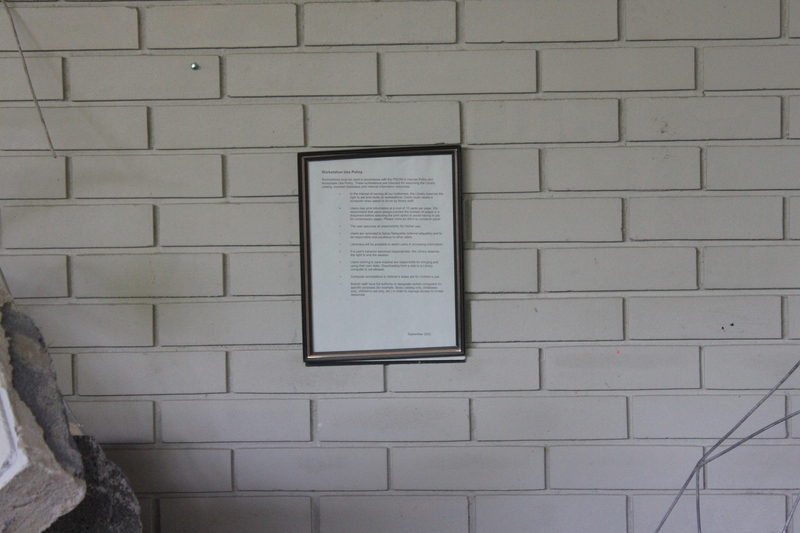 I could put them all together to form an actual Lost Laurel wall… if not an actual Lost Laurel Museum. 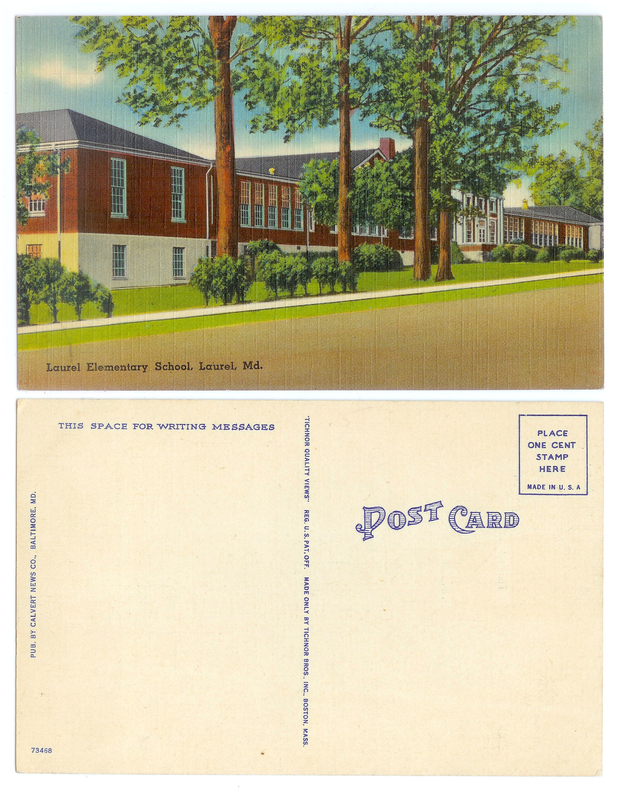 Admittedly, I don’t often focus on Laurel’s schools and other municipal buildings; but every so often, I’ll come across something particularly interesting that I feel should be on this blog. More than likely, it will come from someone else who’s taken the time to share special family photos or artifacts. 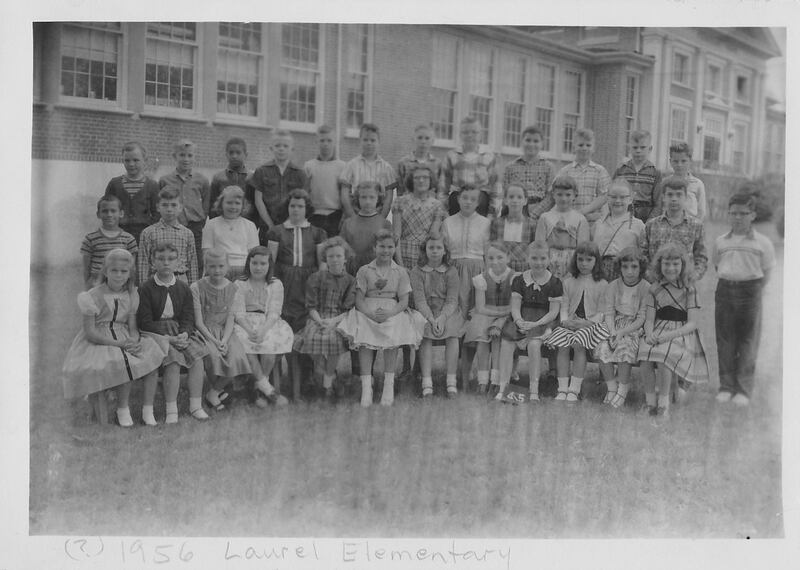 Such is the case with the following class photos from Laurel Elementary School on Montgomery Street in the 1950s and 60s, courtesy of Janice Kaifer. 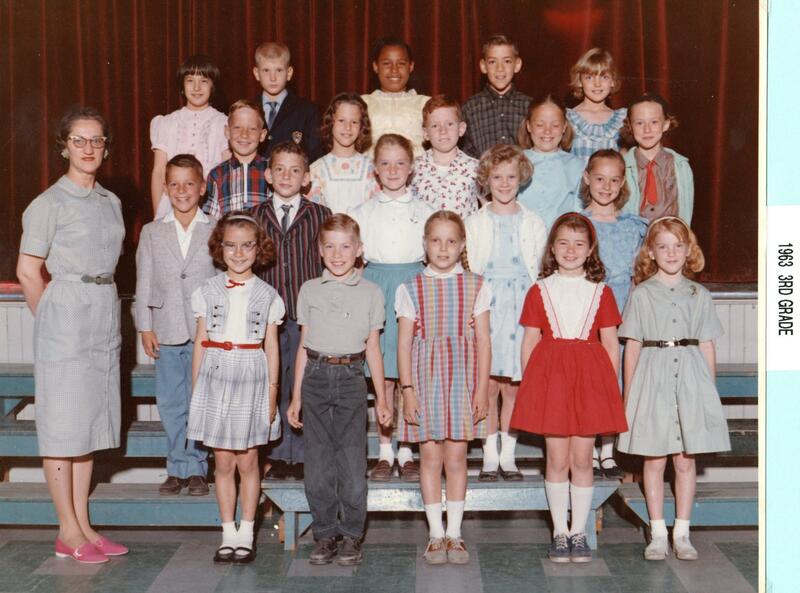 These are good quality scans, so be sure to click on the photos to view them at full size. Perhaps you’ll recognize someone! 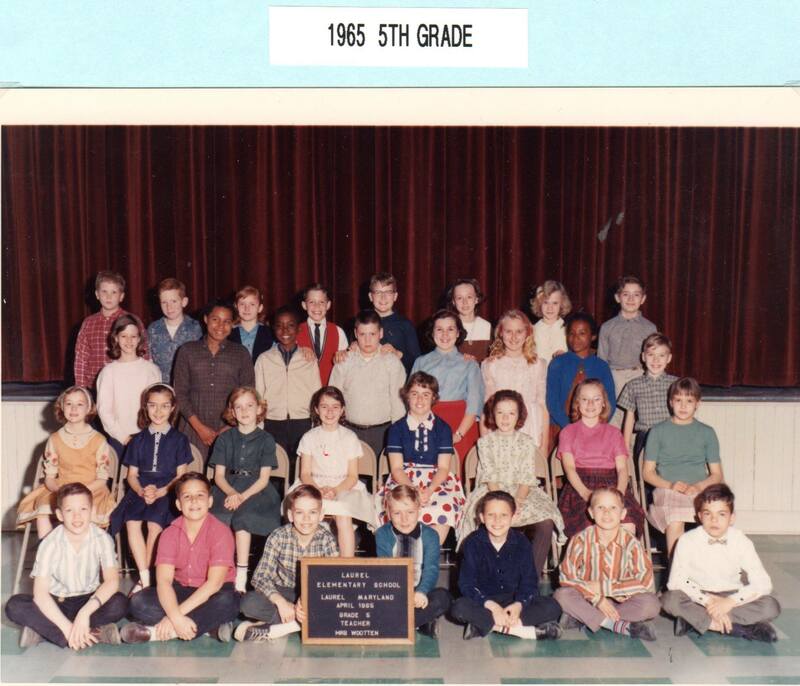 With any luck, some readers may find themselves, and/or family and friends in some of these photos. 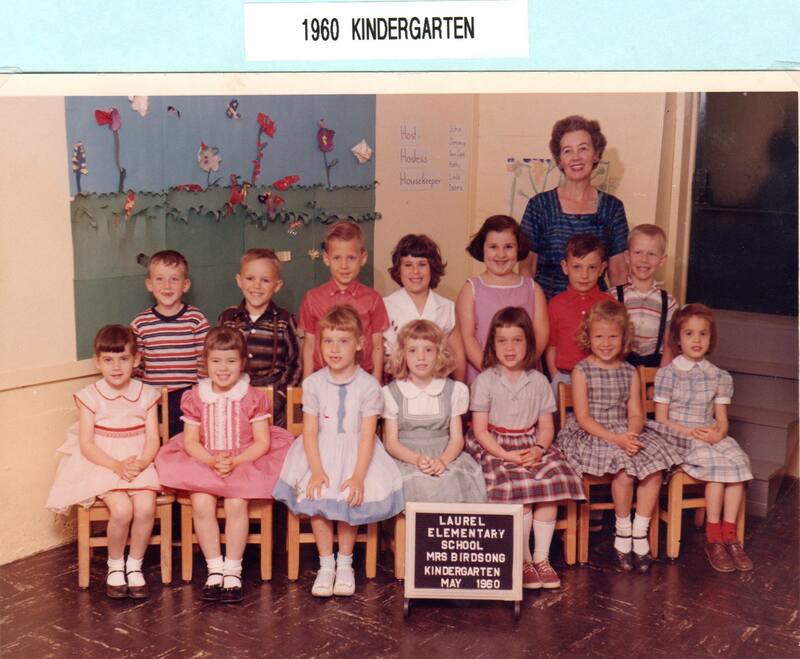 Many thanks again to Janice for taking the time to scan and share them! 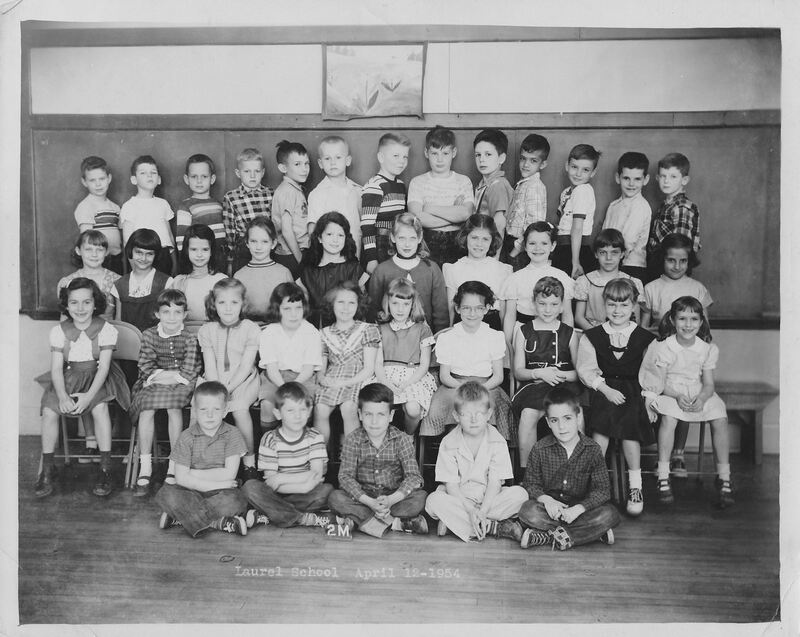 The old building was replaced with a more modern facility a few years after these class photos were taken. 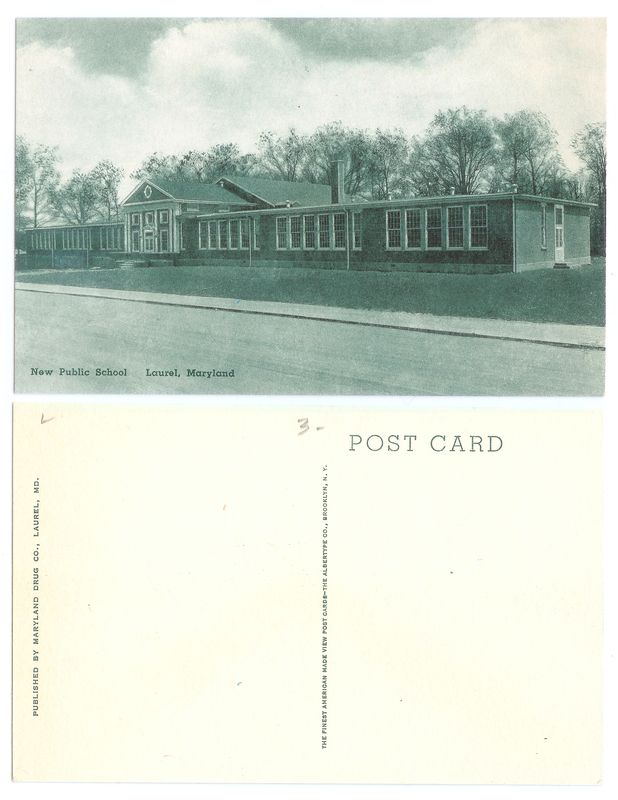 If anyone knows the year the current structure was built, (or can elaborate on the history of the original building) please leave a comment below. 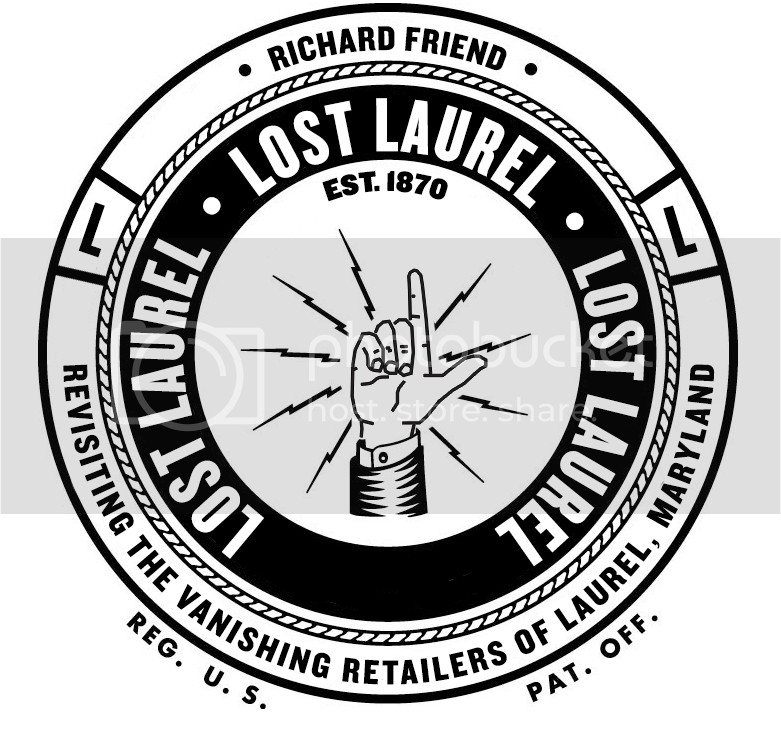 The latest episode of Lost Laurel on Laurel TV is the second part (and finale) of our special History of Laurel Shopping Center. 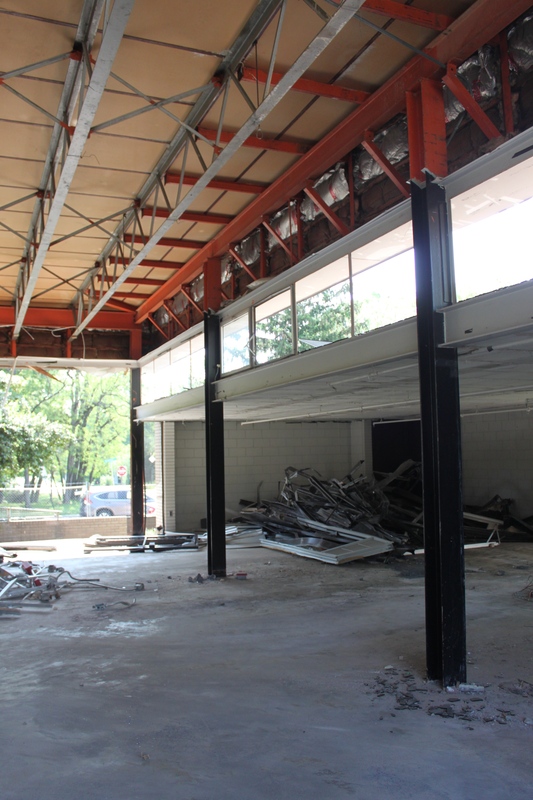 Whereas Part 1 focused on the 1956 grand opening festivities, Part 2 covers the 1966 expansion that doubled the shopping center’s size; as well as the 1971 addition of Georgetown Alley, and 1979 arrival of Laurel Centre Mall. There’s also a segment on the shocking 1972 assassination attempt of Governor George Wallace. Laurel Leader “History Matters” columnist Kevin Leonard and I had the pleasure of spending a morning reminiscing on location with Denny Berman, whose father and uncle built Laurel Shopping Center. Denny, who fondly remembers the Fifteen Fabulous Days grand opening as a six-year-old, essentially grew up at the shopping center—where he eventually joined the family business, and today is a General Partner of Berman Enterprises. This episode also marks entirely new territory for me, having had to learn (very quickly, I might add) to both film and edit it myself. Tyler Baldwin, who had not only deftly handled such duties for each of the previous episodes—but initially pitched the very idea for the series—started a new job in December. (Good luck, Tyler!) Rather than start over with another director, I decided to take a stab at producing it all on my own and simply delivering the final product to Laurel TV. While it was a little scary, (and a lot of work) I have to say, I did enjoy putting it together and being able to see the story evolve from start to finish. I hope you’ll enjoy the result, as well. My thanks also to sound designer Donnie Conty, who (despite having never been to Laurel before in his life) joined Kevin, Denny and me on that cold, rainy morning at Laurel Shopping Center to ensure that I filmed everything correctly. He then worked his audio magic on the final cut, making sure it sounds great. My plan is to continue producing the show on my own, hopefully still at a rate of one new episode per month. I’ve already started on January’s edition, which you’ll see a teaser for at the end of this one. 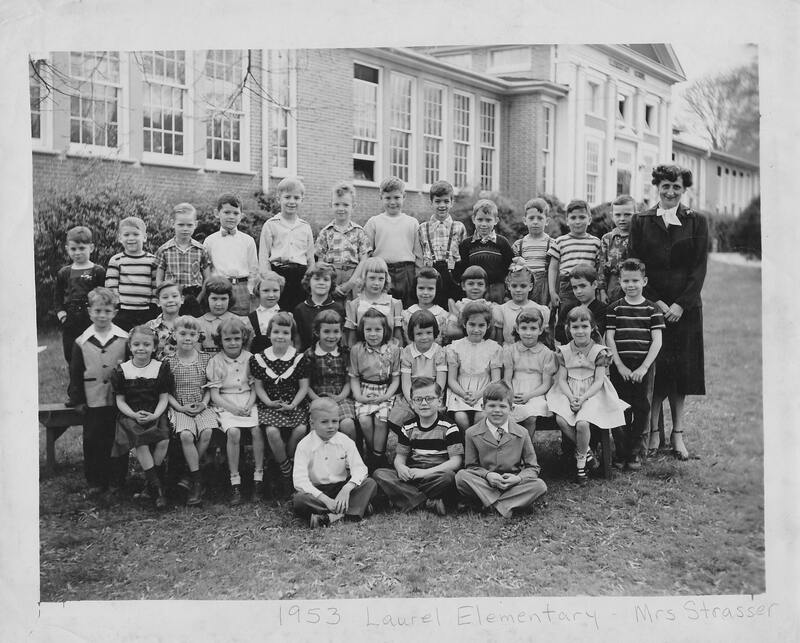 It will cover the Lost & Found Laurel exhibit, which just closed at the Laurel Museum on December 21st. Beyond that, let me know what you’d like to see! I’m considering everything from past restaurants, department stores, specific neighborhoods, vintage crimes, and more. Keep the ideas coming, and as always, thanks for your interest! Laurel Leader columnist Kevin Leonard and I recently had the pleasure of spending a morning at Laurel Shopping Center—reminiscing with the wonderful Denny Berman, whose family built the complex in 1956. I’m still working on the full episode for Laurel TV, (this busy holiday schedule isn’t cooperating) but here’s a teaser trailer in the meantime. My thanks to Denny and Kevin for braving what turned out to be a cold, rainy morning—albeit one that didn’t hinder the memories. Also, to Donnie Conty, who helped set us up with the necessary tools to produce this one on my own. I think it turned out well, and hopefully you’ll be as excited about this upcoming episode as I am! The latest episode of Lost Laurel on Laurel TV has aired, and is available on their YouTube channel. They’ve given me an HD version to post for my own archive, which is great, since the video includes some fantastic vintage photos! 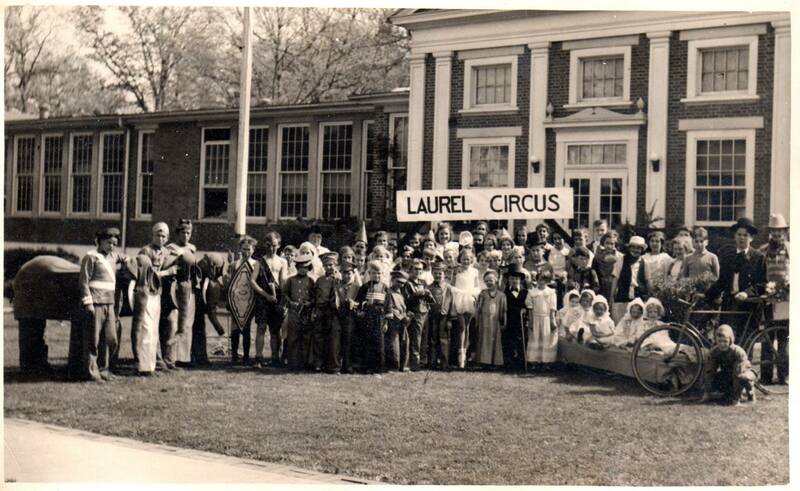 This is the first of a two-part series on the history of Laurel Shopping Center, which focuses on the 1956 grand opening—including an itinerary of the “Fifteen Fabulous Days” celebration, the incredible promotions created by owners Melvin & Wolford Berman and Arthur Robinson, and an interview with Bart Scardina, Jr., whose father opened Bart’s Barber Shop as one of the original tenants. Of those original businesses, only Bart’s and Giant Food remain open today. 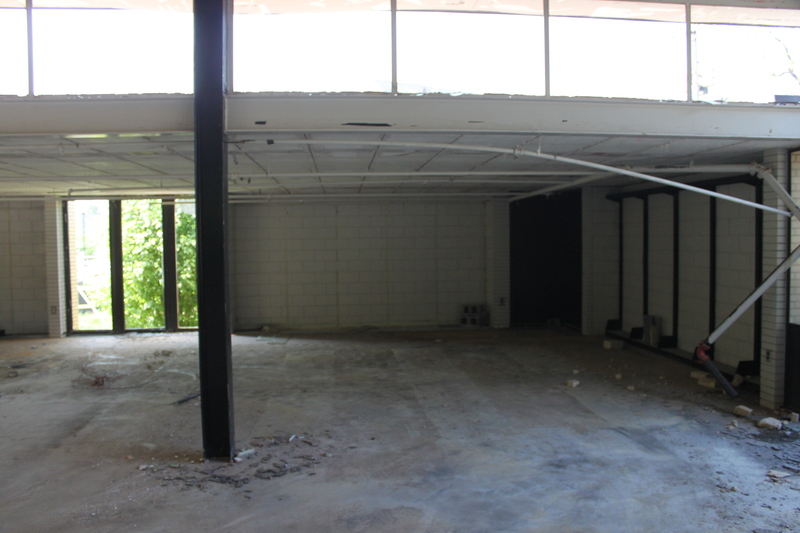 Part 2 will cover the 1966 expansion of the shopping center, the 1971 addition of Georgetown Alley, and the 1979 arrival of Laurel Centre Mall. 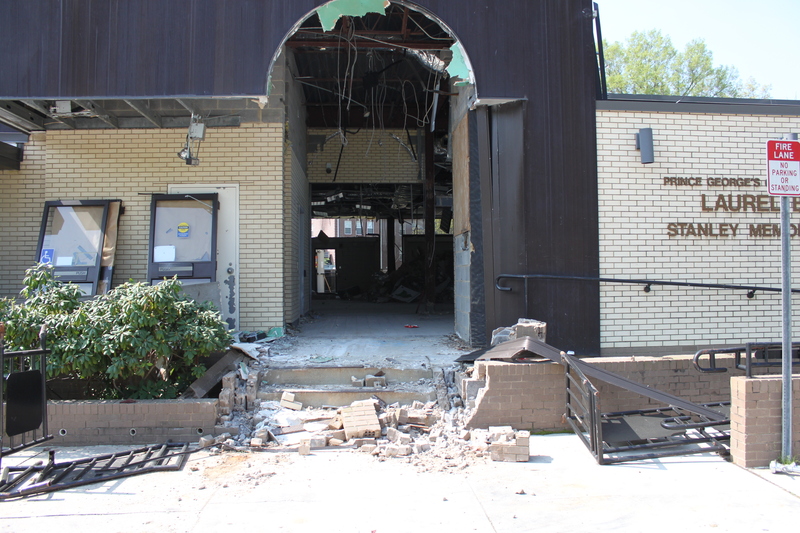 We’ll also look at Laurel Shopping Center’s day of infamy—the 1972 assassination attempt of Governor George Wallace. We’ll be filming that in the coming weeks. 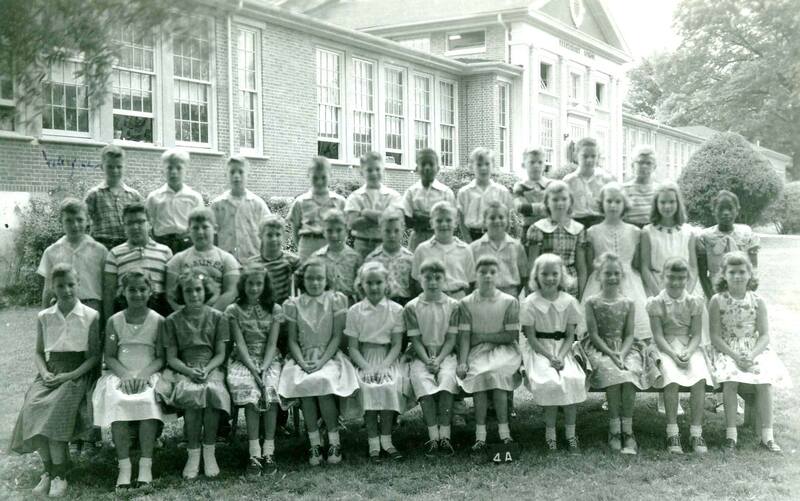 As always, a special thanks to Laurel Leader “History Matters” columnist Kevin Leonard for his segment, and to Denny Berman and Bart Scardina, Jr. for taking the time to share their memories. Fair Lanes: Bowling for Patches! And I wasn’t that bad a bowler. 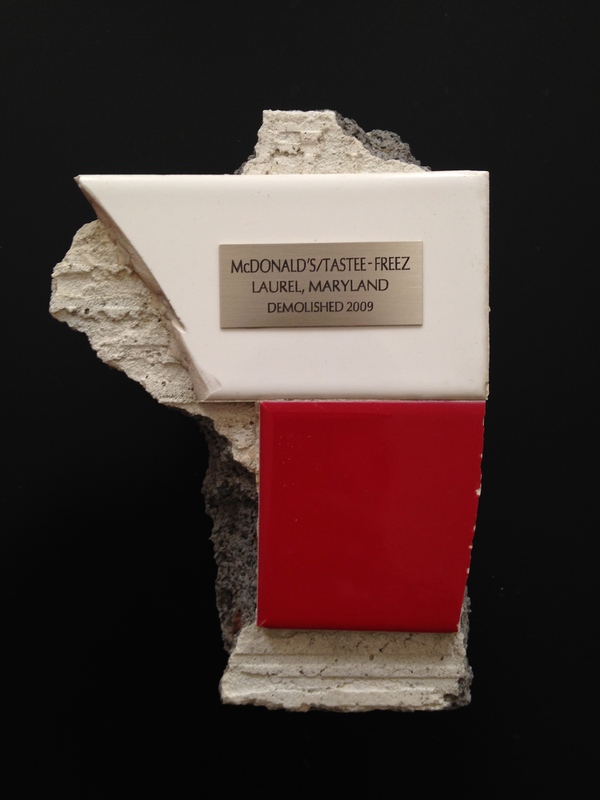 In fact, I had a handful of these little patches—awarded for various league achievements. But looking at them today, they’re pretty lackluster as far as patch designs go, aren’t they? In fact, the most ornate of the ones I earned are probably these, which aren’t much better. These were the products of the new Fair Lanes of the early 80s—the recently re-branded version of the venerable bowling alley franchise, which sought to distance itself from the stereotypical bowling alley riffraff of the 60s and 70s. A new logo (a stylized hand releasing a bowling ball) was paired with a new bold italic typeface, creating a more modern look and feel. 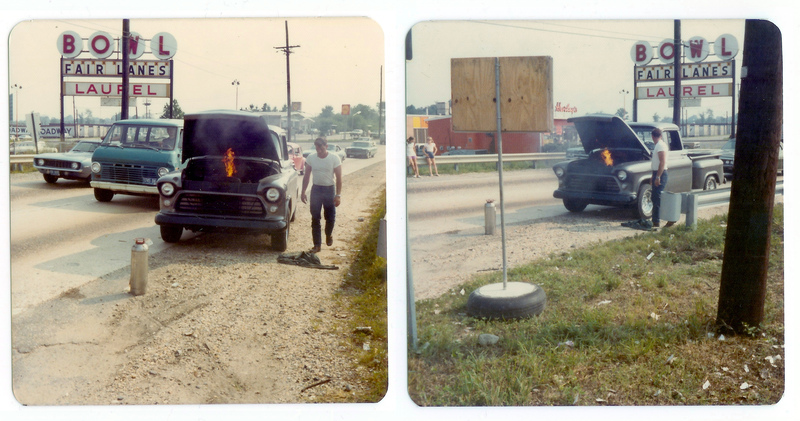 However, Laurel’s bowling alley (which opened in 1961) kept its original sign along Route 1 for some time afterward, before the new logo was finally applied. The sign was so well designed, it actually became as iconic as the logo itself. It was used throughout the 60s and 70s on some of the most prestigious league award patches a bowler could earn. And comparing them to the more understated versions of later years, you can really get a sense of just how strong the brand identity was. The Fair Lanes sign evoked excitement in a Las Vegas way—big, bold, and bright. The vintage patches I’ve found that incorporated it into the design capture that spirit in an array of color combinations that, frankly, make you want to stop whatever you’re doing and just go bowling right now. Many of the more minor patches didn’t use the literal sign, but still featured the original Fair Lanes logo prominently. These “I Beat My Coach” patches are interesting—depicting a humanoid bowling ball standing victoriously over a vanquished, dead pin. Who says bowling isn’t a violent sport? The leagues that I played in also never used the classic bowling shirts that you think of—we had these boring, short sleeved polos, where the most colorful feature was the small screenprinted logo itself. You could put as many of those little stars on it as would fit, but it still didn’t have the awesomeness that any one of those vintage patches would have wielded. That gives me an idea. Maybe I should have these all sewn onto a vintage button down bowling shirt, and then wear it into the nearest bowling alley and just watch people’s heads explode. 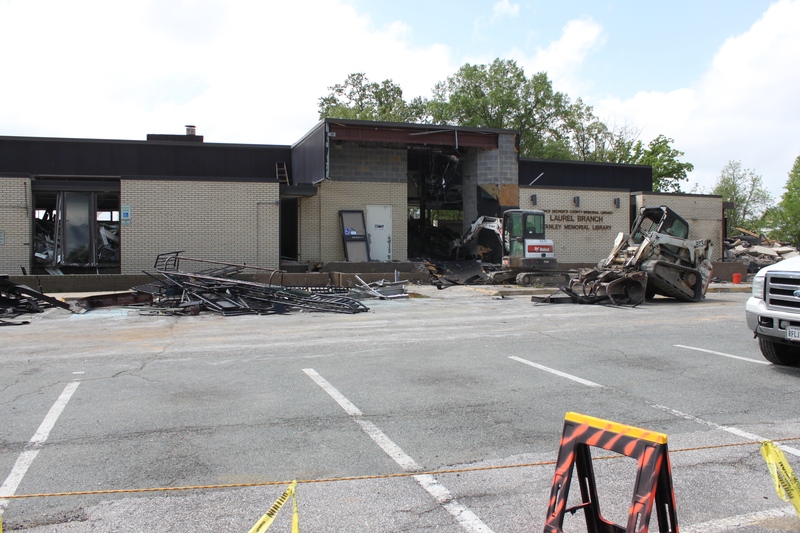 Laurel’s bowling alley is still there, still open for business under AMF management. The duckpins are long gone, however; as is that familiar aroma of lane wax that used to hit you as soon as you entered the door. We can thank the advent of synthetic lanes for that travesty; but I can still see no reason why bowling patch designs should have ever been tamed. Admittedly, I’ve never been great about saving receipts. Unless it’s a business expense, a warrantied purchase, or something that I’m not sure I’ll actually keep, (or all of the above) that receipt is usually crumpled up and tossed away with the bag it came in. I think most of us are probably wired that way. 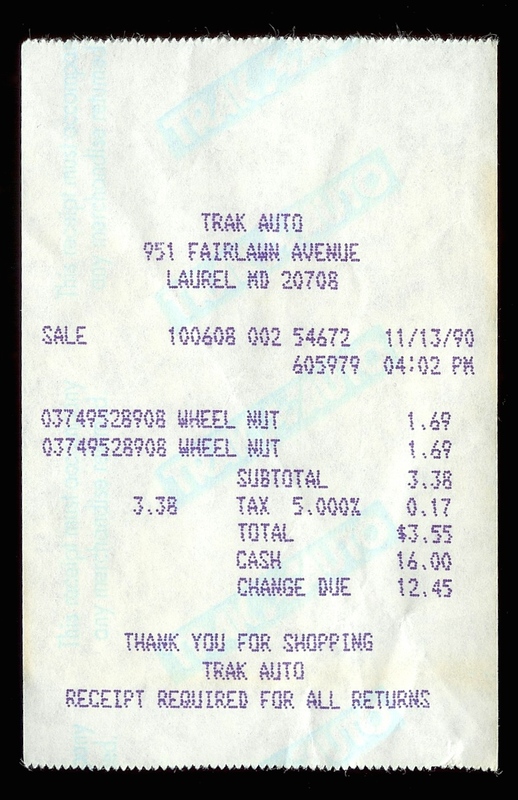 Receipts are simply one more piece of clutter that we just don’t need. 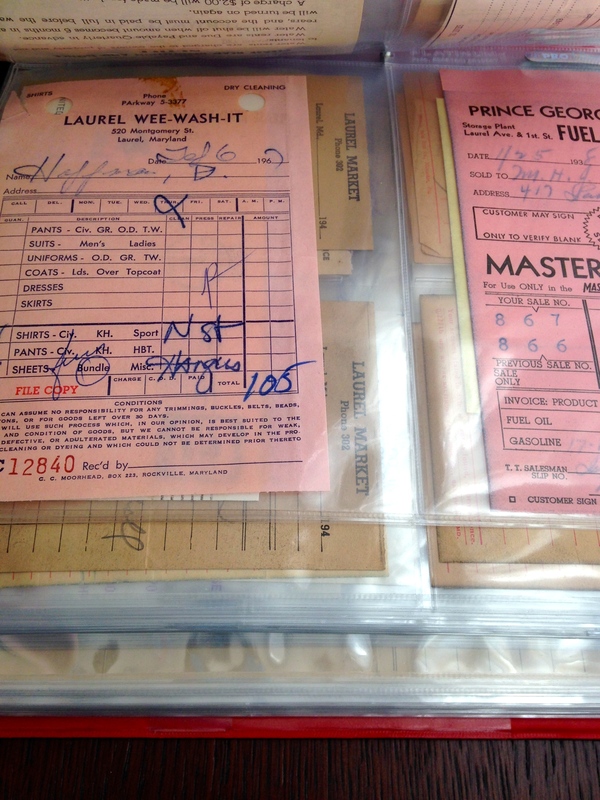 So it’s with some irony that in the past year or so—through the help of collectors like John Floyd and Pete Lewnes—I’ve assembled a binder of over 200 vintage Laurel business receipts and other paper ephemera that date from the recent past… all the way back to the 1930s. It’s turned into a most unexpected scrapbook; a collection of familiar names and places evoked not by photos, but by those simple little strips of paper. 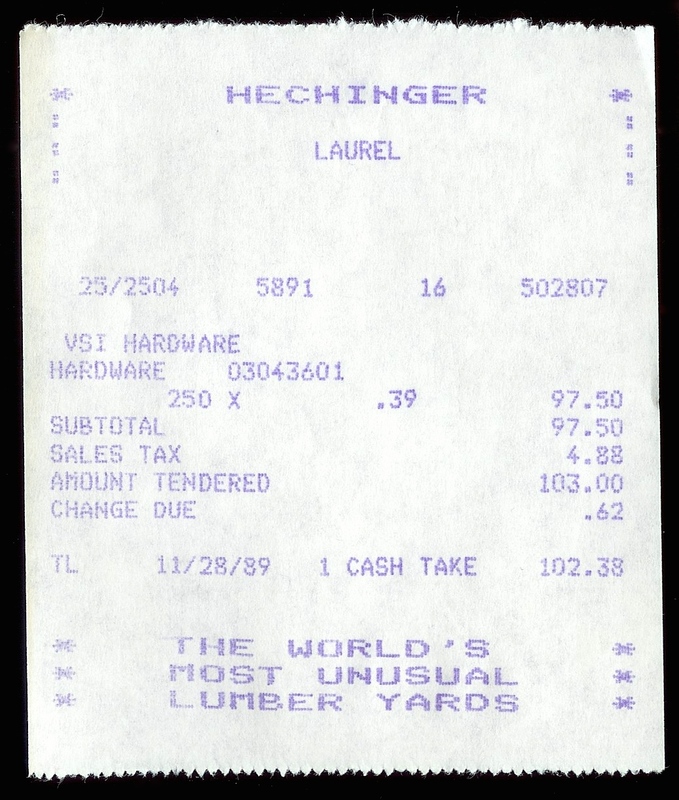 It’s funny how something so insignificant as a receipt can trigger memories of the business itself, your experiences there, and the time frame in general. I’ll eventually get around to scanning the entire lot, but I wanted to share a sampling. We’ll start with some of the more recent ones that many of you probably remember chucking away at one time or another yourselves. 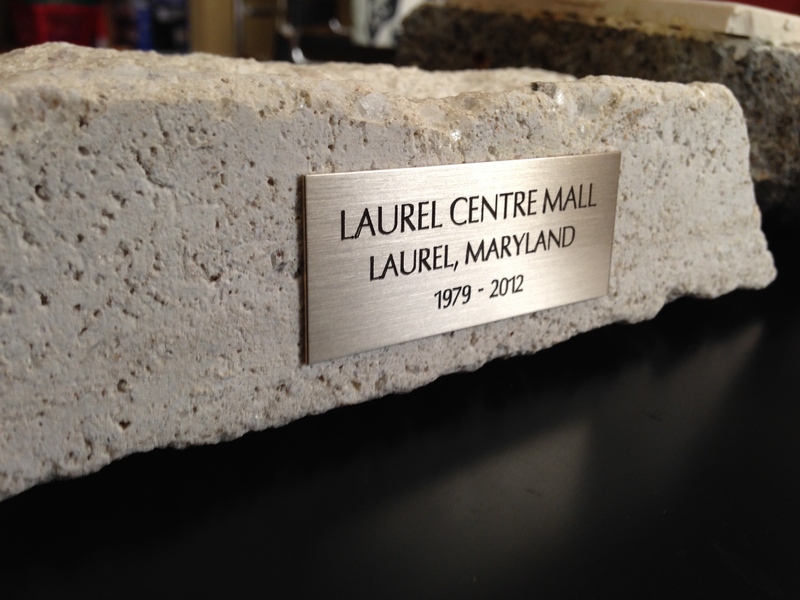 Here’s a very recent one I kept personally, when the Laurel Art Center on Main Street closed its doors in 2012. And yes, that’s 75% off. There’s no sale quite like a going out of business sale. 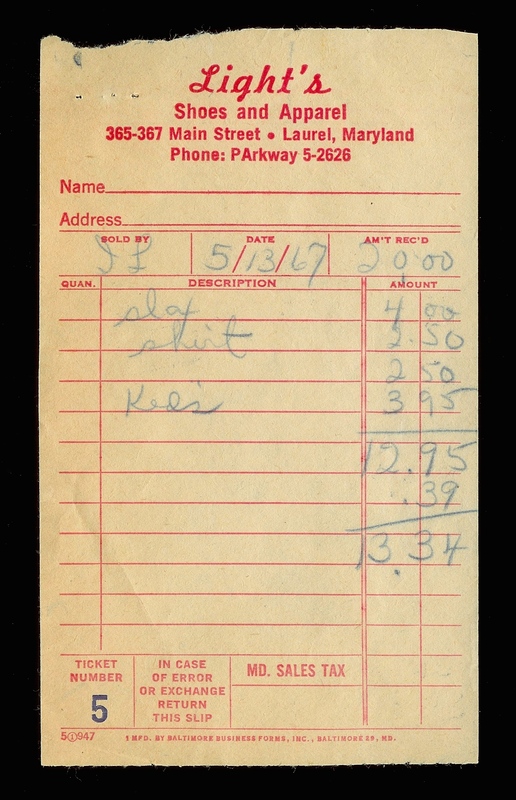 When we think of receipts, we typically think of the type shown above—those thin, white ribbons of paper with digital printing. 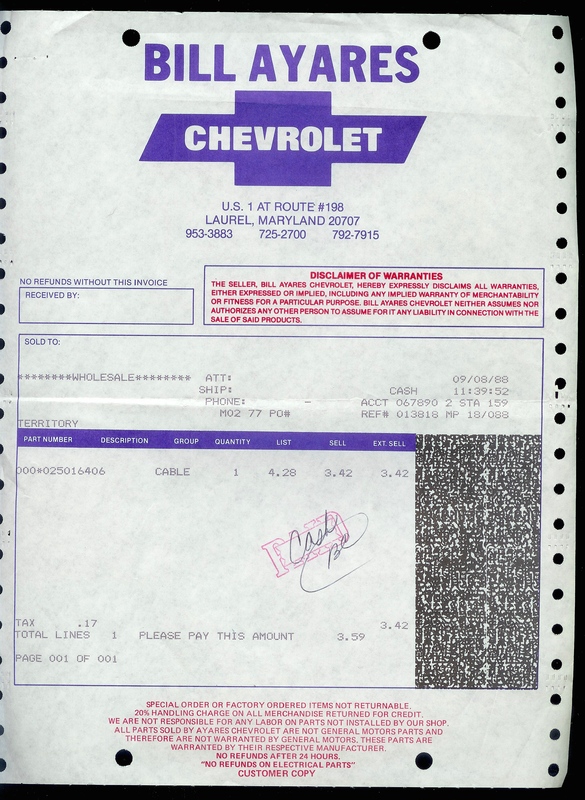 That’s been the norm for most, but many businesses also utilized larger, invoice-style tickets that were offset-printed with their name, logo, contact information, and space for writing things in by hand. The further back we go, the more handwriting we see. 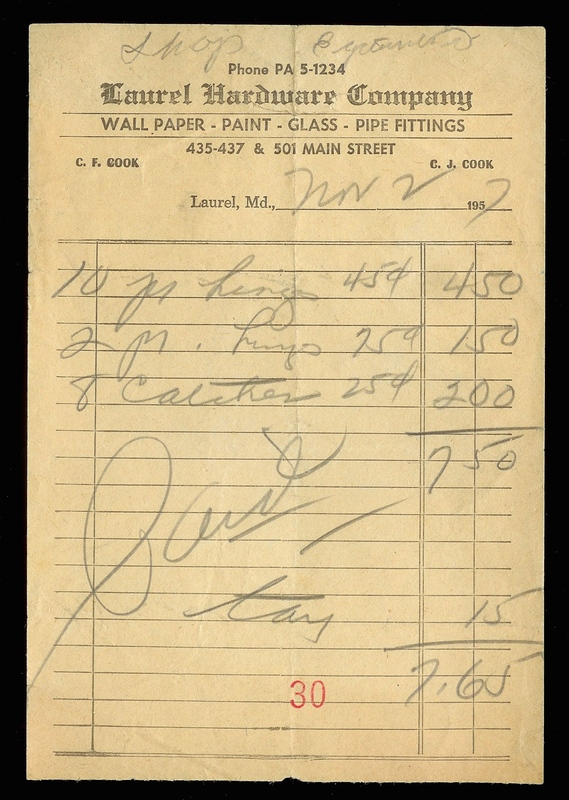 While we’re still on Main Street, here’s a receipt from Ashby & Harrison. If the name doesn’t ring a bell, their 309 Main Street address should. It’s the building that became Gayer’s Saddlery, which today is Outback Saddlery. By this point, you’ve probably also noticed the unusual phone numbers on some of these. 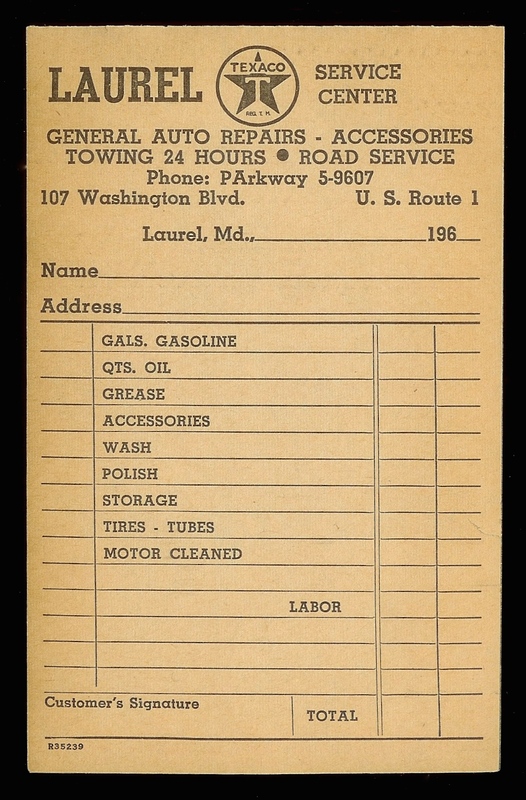 The “PArkway 5” exchange is technically still in use today: the letters “P” and “A” plus the number 5 comprised the familiar “725” prefix that many Laurel numbers continue to use. And prior to the rotary phone’s arrival in 1954, those numbers were even stranger. Imagine having a three-digit telephone number today! 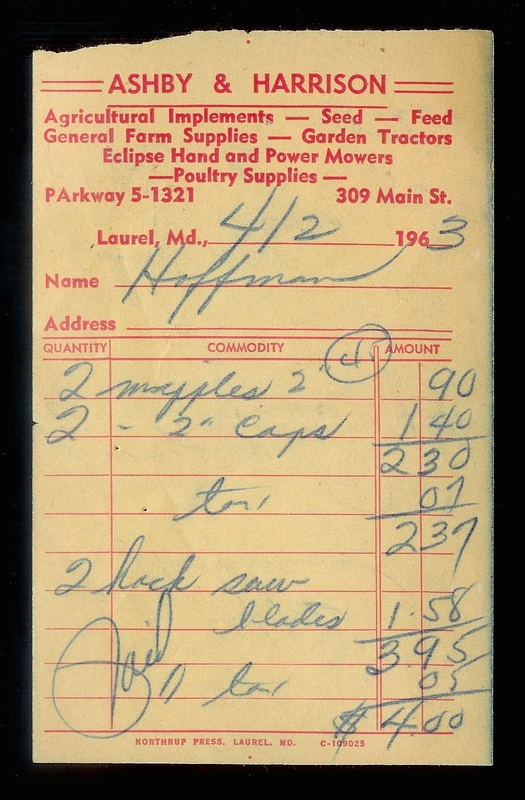 Another interesting thing about old receipts is that they invite you to learn more about the businesses themselves. 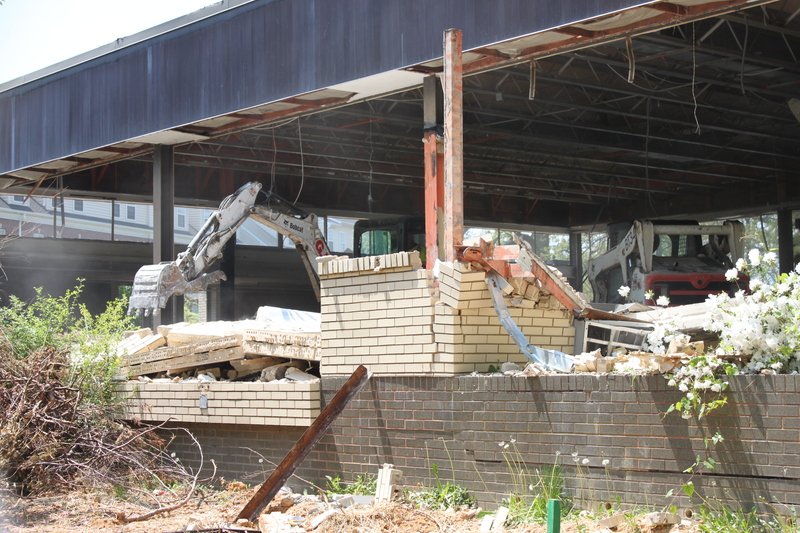 Here’s one for another gas station—this one at Laurel Shopping Center. But it wasn’t any old gas station. 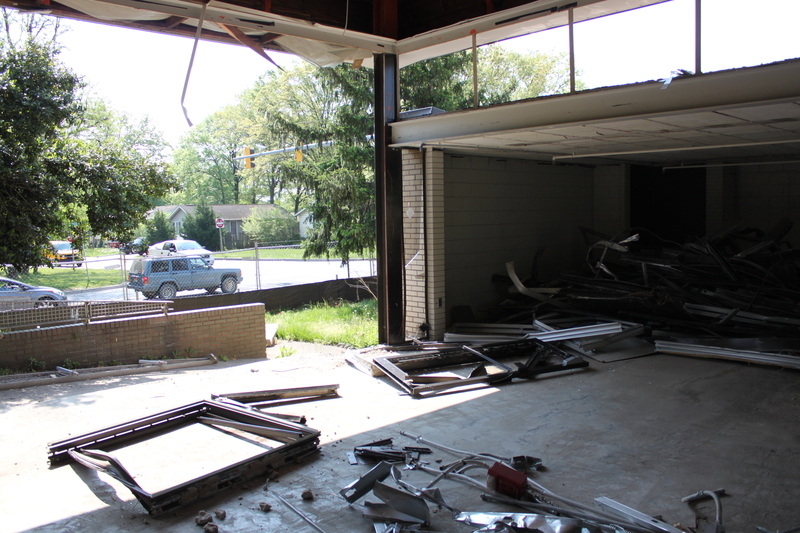 Hardingham’s Service Center was owned and operated by Harry Hardingham, the popular two-term Mayor of Laurel in the 1950s. 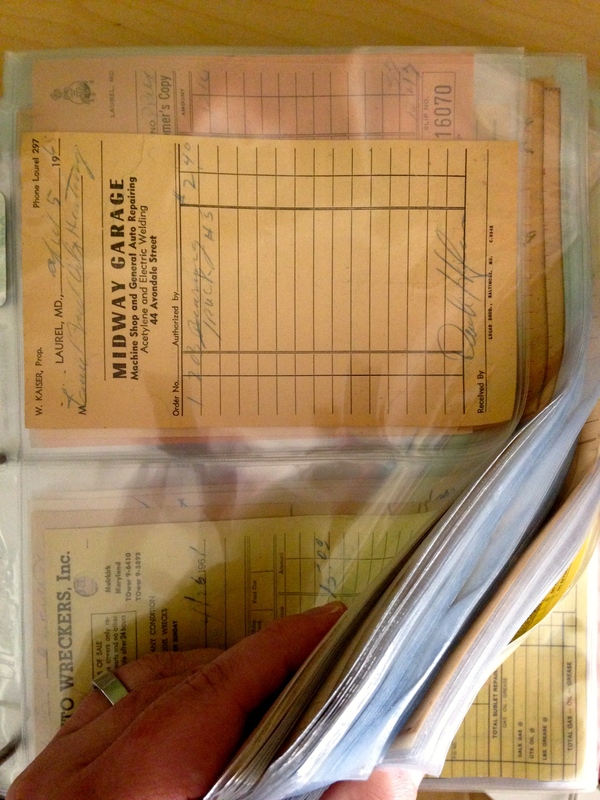 Other familiar names appear in these old scraps of paper; records of fleeting moments in time. 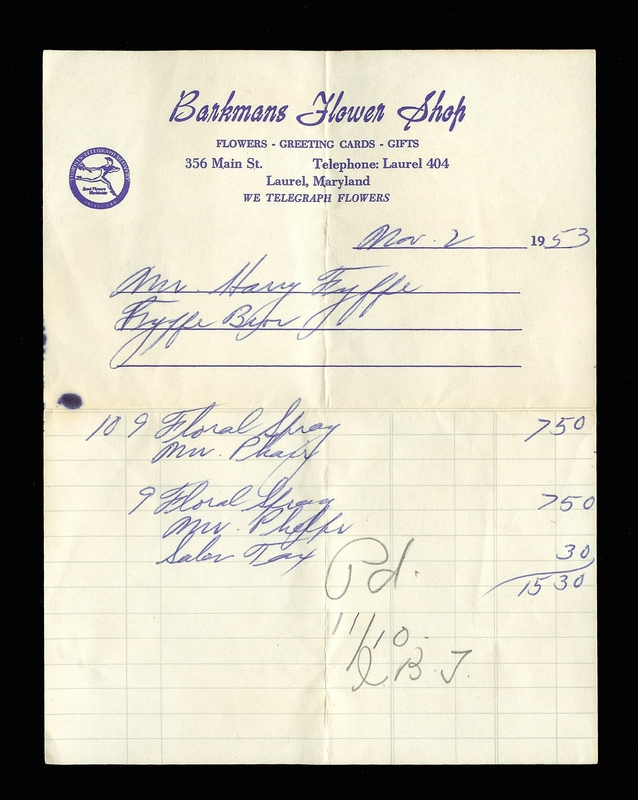 This one shows Harry Fyffe (of Fyffe’s Service Center) having purchased two floral sprays from Barkman’s Flower Shop in November, 1953. They appear to have been for the funerals of “Mr. Phair” and “Mr. 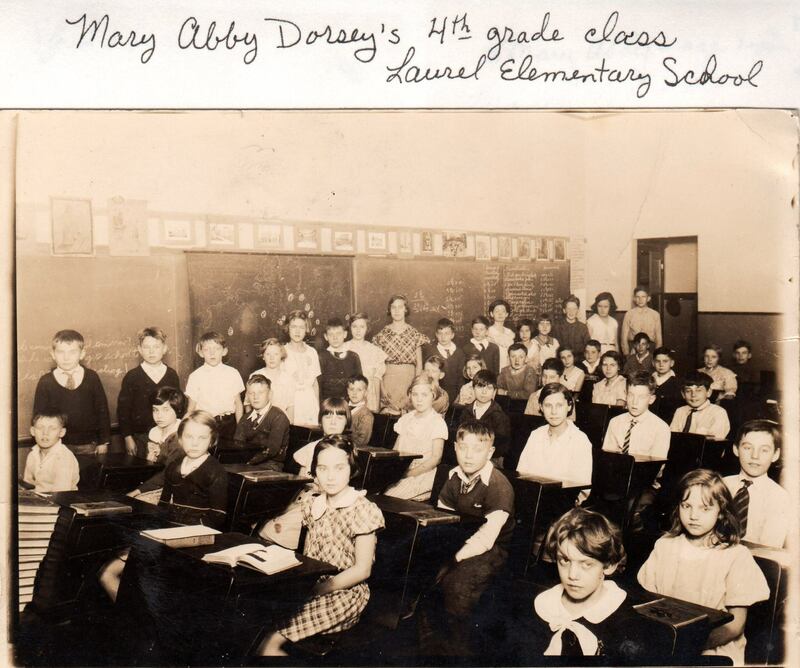 Phelps”—two other well-known Laurel family names. 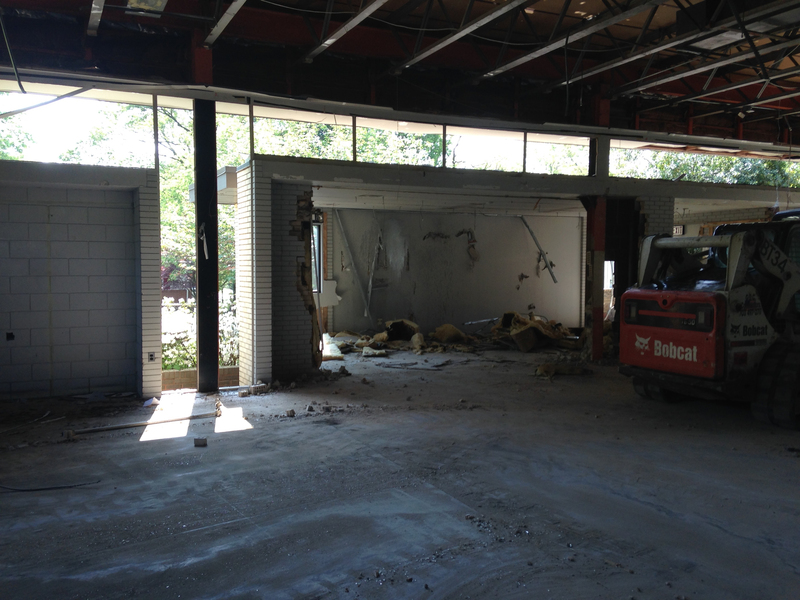 Another interesting set comes from Laurel’s many garages and car dealerships throughout the years. 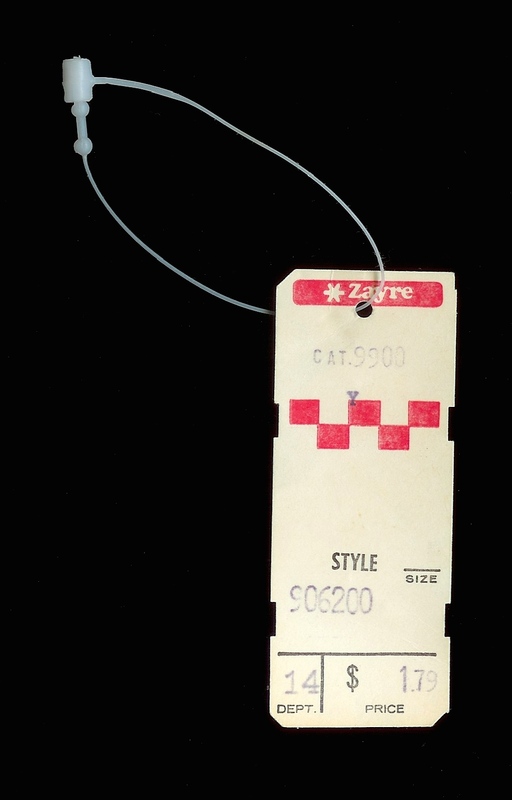 One of my favorites in the collection isn’t a receipt, but rather an actual price tag. This came from a miniature Rubik’s Cube keychain I found recently on eBay—just like the one I remember getting from Zayre as a kid. 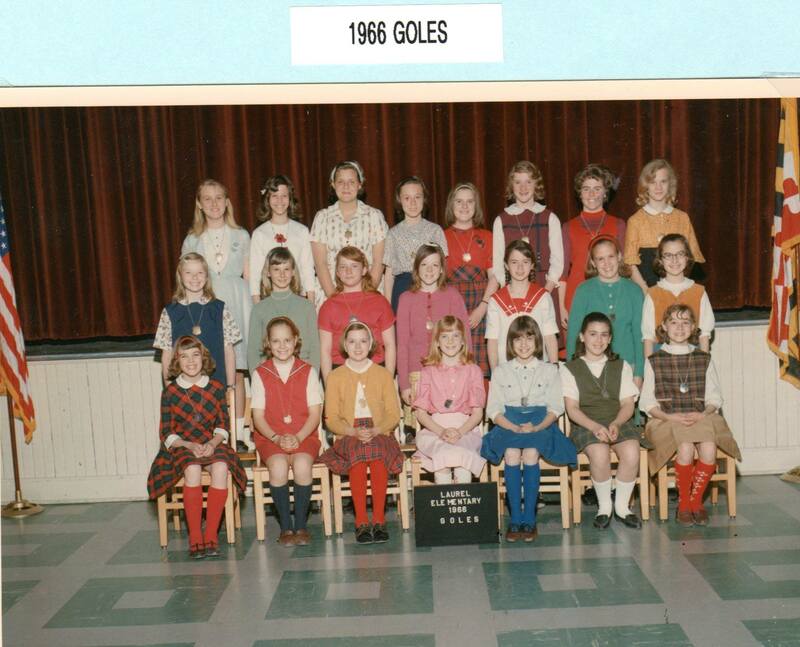 Of course, when I was a kid, the first thing I had to do was get rid of that price tag. Today, ironically, it’s the other way around. All I wanted was the price tag. While I was growing up at Steward Manor during the late 1970s and early 80s, grocery shopping was never really a problem. In just a matter of minutes, if my mom and I were so inclined, we could walk to and from Safeway—which, at the time, was just around the corner from us on Bowie Road. In fact, during the one year that we lived at 2 Woodland Court, it was literally just across the railroad tracks. For more extensive shopping, of course, my dad would drive us there (or more likely, to one of the bigger and/or cheaper stores in the area: Giant, Pantry Pride, or Basics). But on any given day, my mom might have decided to bake a cake or something; and needing only a few select items, she and I would take a quick walk over to Safeway. 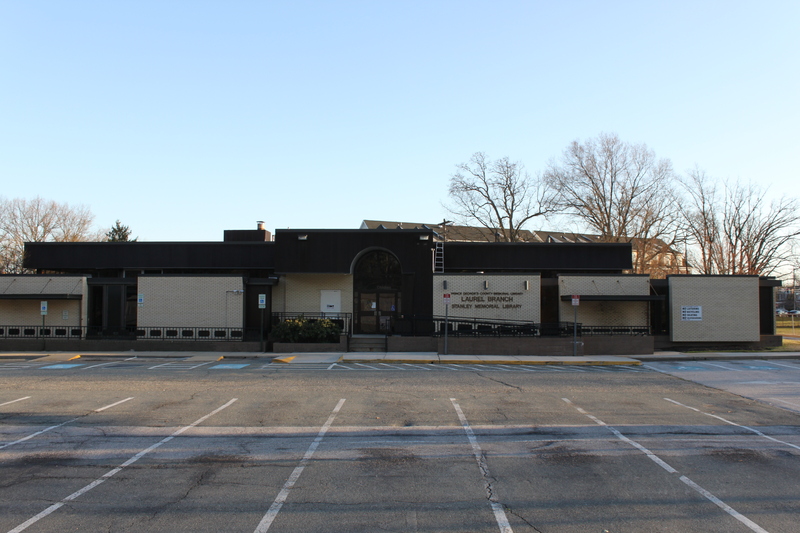 Until this past weekend, I hadn’t been able to find a single photo of the Safeway that I so vividly remember from childhood—before it relocated to a new and larger space at Laurel Lakes in 1985 (where it remains today). 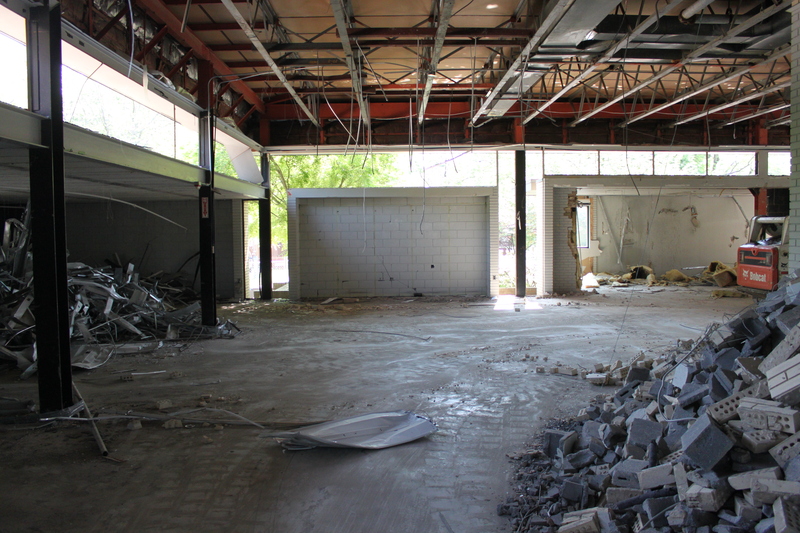 For me, the old Safeway was the real Safeway; and when it left, it was like losing an old friend. To this day, I occasionally have dreams in which I’m back in that store—perusing the Cragmont soda aisle and noting the vintage cash registers at the checkout counter, amongst orderly stacks of weekly magazines featuring the likes of Diff’rent Strokes and President Reagan on their covers. 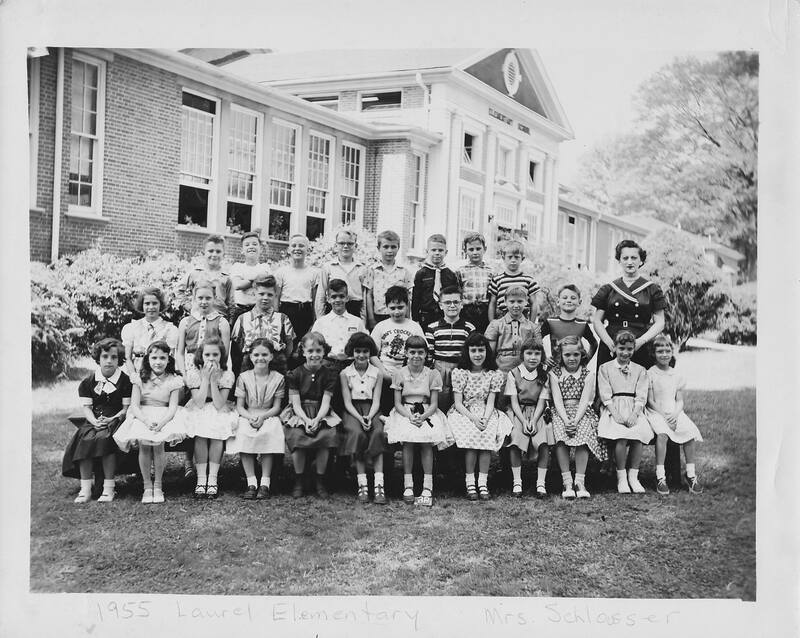 So in the course of my research, when I turned the page in the April 21, 1966 issue of the Laurel News Leader and came to this photo—I smiled at an old friend. There it was, just as I remembered it. But even newer, because it had just opened. From this angle, (taken from the adjacent shopping center, which had also just opened) you can even see that awesome roller track/conveyor belt thing, which transported your groceries from the checkout counter, outside, around a hairpin curve, and to your awaiting vehicle beneath that covered driveway. (This, of course, was the only downside to walking over to Safeway with my mom—I didn’t get to use that thing nearly as often as I would have liked, but I digress). 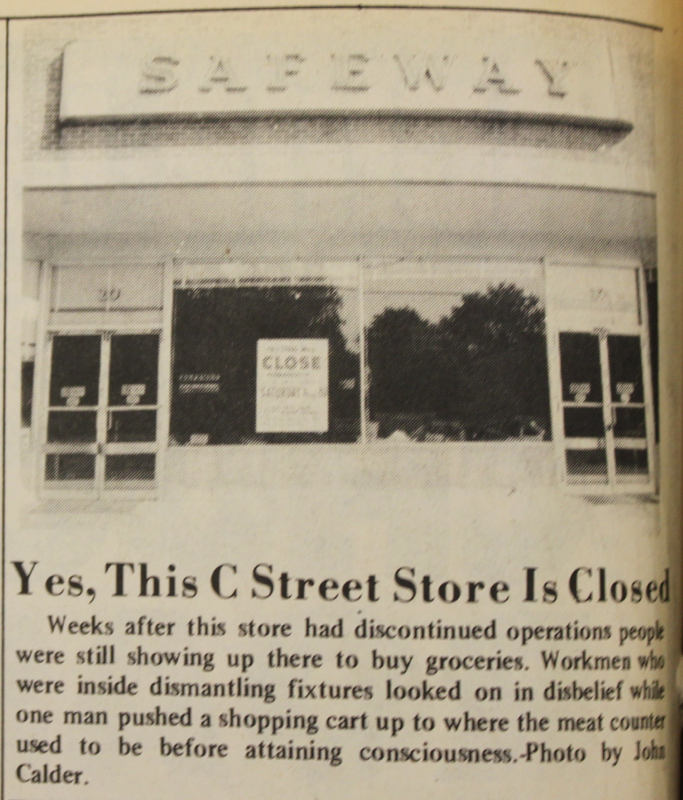 Admittedly, I suspected that I might actually find a photo of the store; in an earlier newspaper, I had come across this bold announcement, which included a stock illustration of a similar Safeway store (but without the aforementioned awesome roller track/conveyor belt thing). Laurel Leader, January 27, 1966. So, a question I’d often wondered about was finally answered. 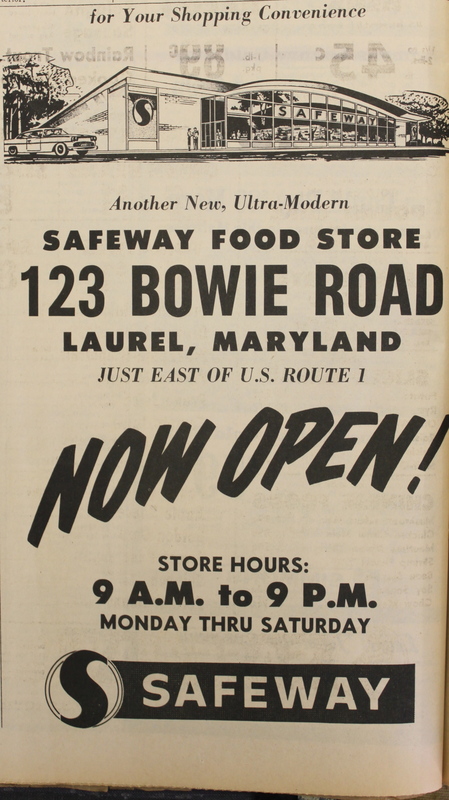 The Safeway on Bowie Road first opened its doors in January 1966. 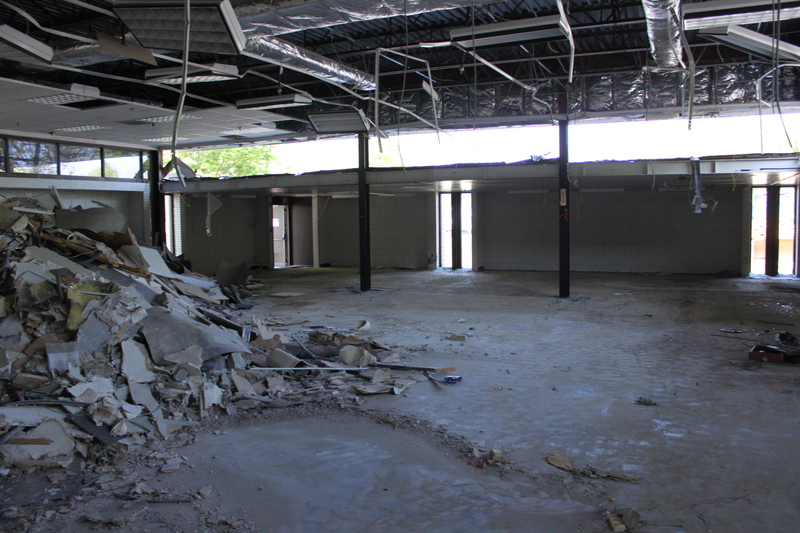 The adjacent shopping center, which included Market Tire, Arundel Furniture, and Chicken Roost, among others—also another story for another time—opened in April. But the photo also raised an interesting question, because conspicuously absent in all this was my other beloved store—Dart Drug. 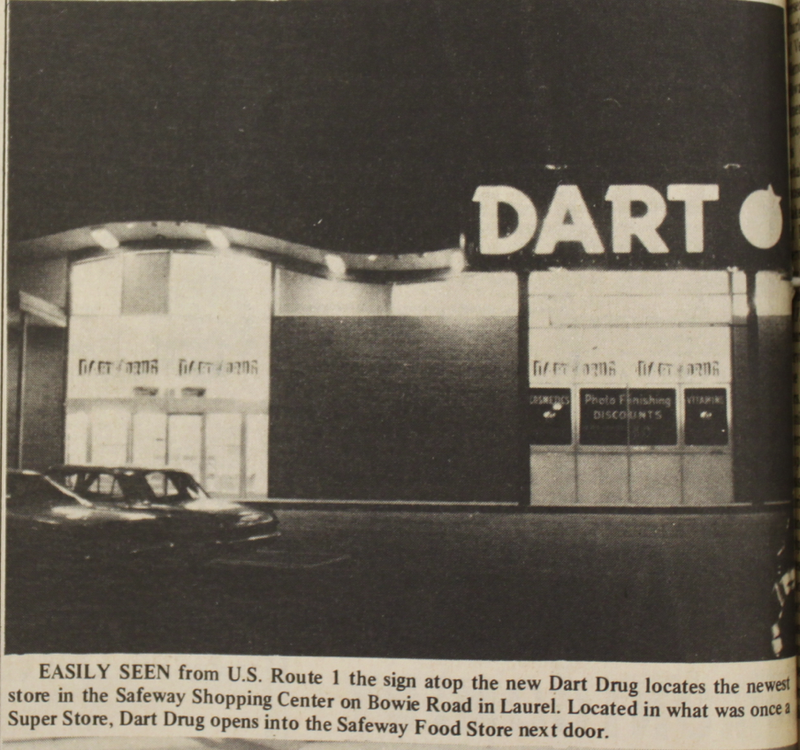 I had always assumed that Dart Drug was the original tenant beside Safeway; that they had been built together. Evidently, that wasn’t the case at all. 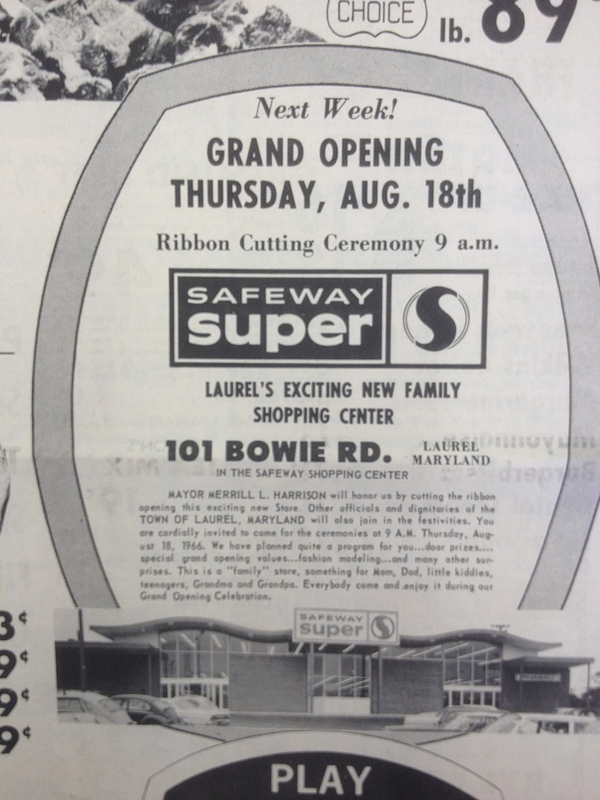 As I continued through the 1966 newspapers, I spotted the following ad in an August issue—which references the mysterious “Super S” store noted in the photo caption above. Safeway Super S? I’d never heard of or seen such a thing, but there it was, in the proverbial black and white. It also immediately struck me as rather ironic that Safeway had actually occupied this entire, massive structure—yet would ultimately move to Laurel Lakes nearly 20 years later in need of more space. What happened there? What exactly was Super S, and how (and when) did it eventually become the Dart Drug that we all knew and loved? The Super S story turns out to be a super-short one, actually. 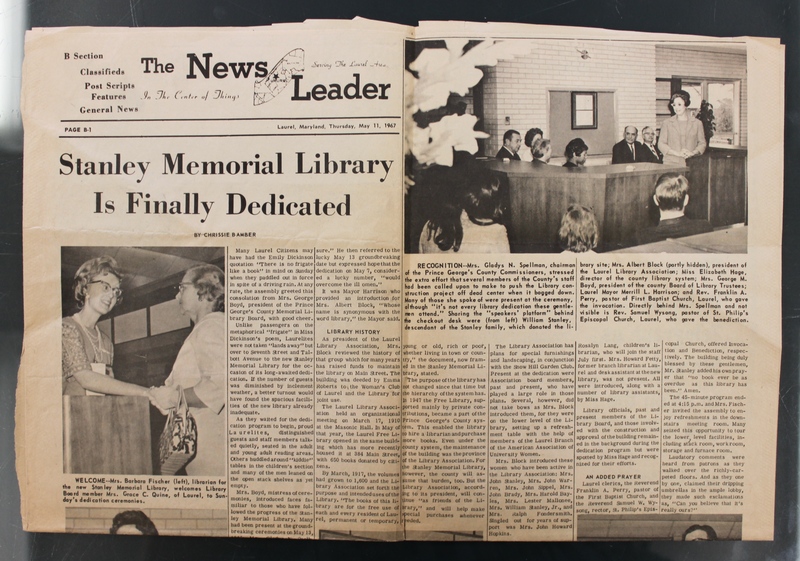 By April 1967—a mere eight months after its grand opening, ribbon-cutting ceremony with then-Mayor Merrill Harrison, the store was closed. Super S, according to the fantastic vintage retail blog, Pleasant Family Shopping, was an early (and ultimately unsuccessful) attempt by the supermarket to parlay its brand into an ancillary store; one which offered the types of non-food items you wouldn’t find in the Safeway proper: small appliances, sporting goods, toys, outdoor accessories, and more. Basically, like what Dart Drug would become. In retrospect, it’s a bold idea that, frankly, seems ahead of its time. Who knows.. with a little tweaking of the Super S business model here and there, Safeway could’ve very easily hit the jackpot. (Not that they haven’t been successful enough on their own, but again I digress). It’s not yet clear if the old Super S building hosted any interim tenants, (my guess is no) but in February 1969, Dart Drug officially took up residence. It would remain there until the company went bankrupt nearly 20 years later. Laurel Leader, February 6, 1969. Here’s another view of the Safeway Shopping Center (as it came to be known) from across Route 1, in what was at that time the Food Fair parking lot. Food Fair, of course, would eventually become Frank’s Hardware, which in turn would eventually become Frank’s Nursery and Crafts—but that’s yet another story or two, as well. 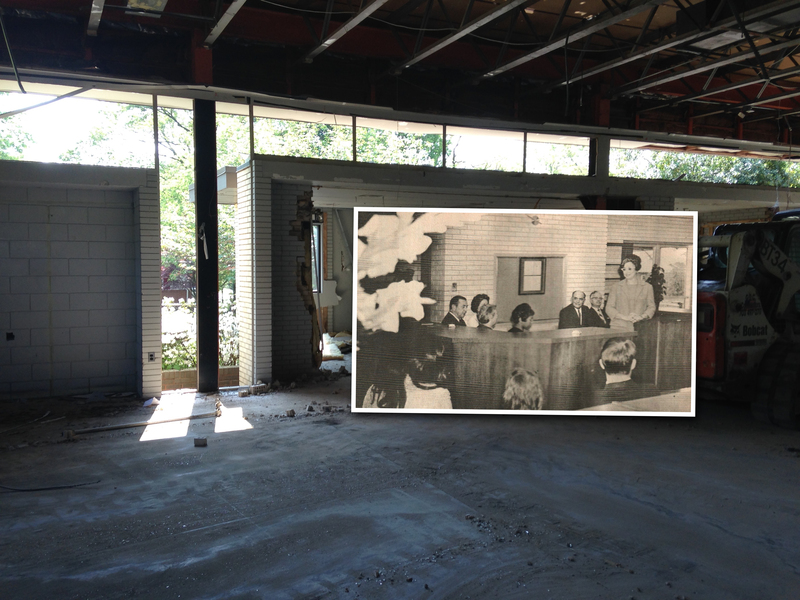 Coincidentally, just a few miles west along Route 198, another Safeway opened in mid-February 1966. 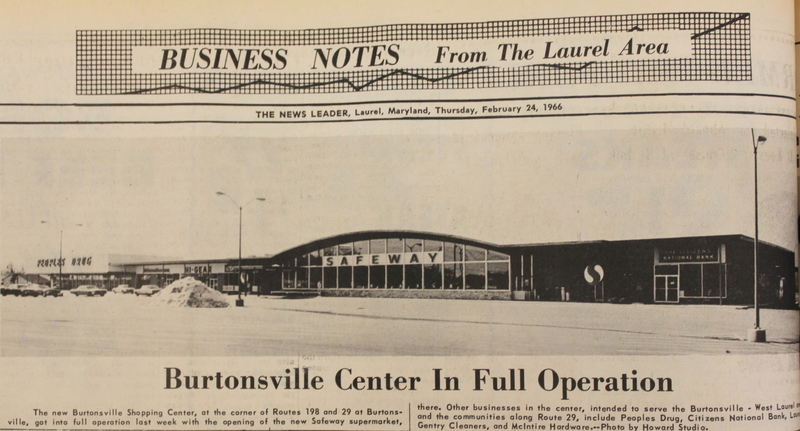 With a Peoples Drug at the opposite end of the Burtonsville Shopping Center, I guess the builders wisely saw no need for a Super S.
Last, but not least, I’d heard many a story about Laurel’s original Safeway—a location just off Main Street that, like its successor, was eventually deemed too small. 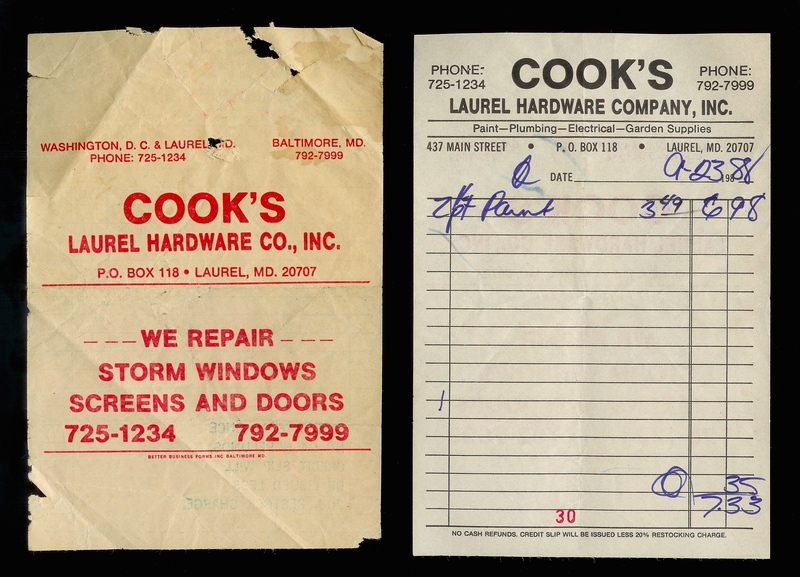 That store was located on C Street, in the little building that would actually become City Hall and the Laurel Police Headquarters in 1972. 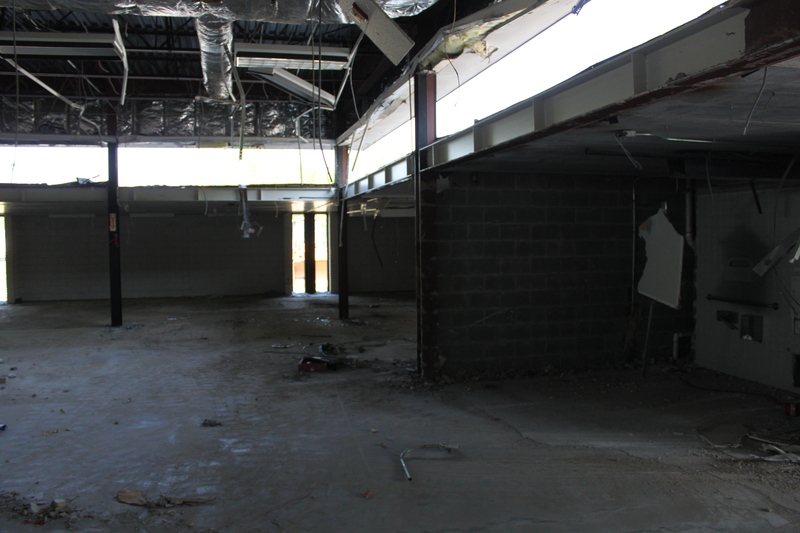 Apparently, it continued to briefly do business even after the larger, new store opened on Bowie Road. In fact, according to this amusing snippet from September 1969, customers were still showing up even after it had closed. Laurel Leader, September 25, 1969. I can relate. They, too, must’ve felt like they’d lost an old friend.